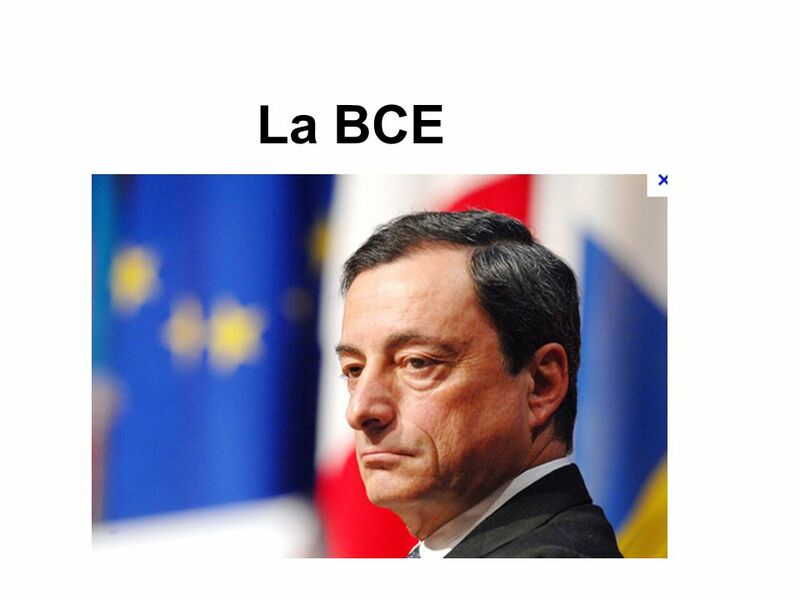 La BCE. 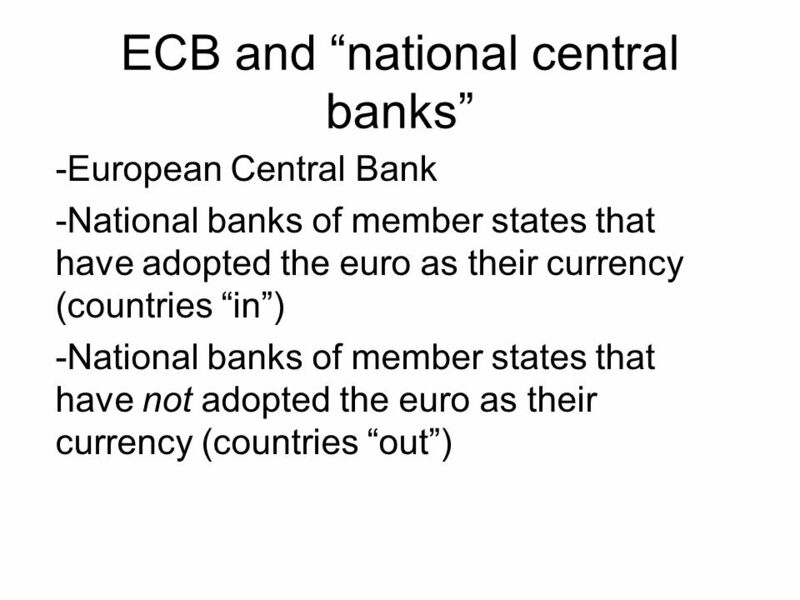 ECB and national central banks -European Central Bank -National banks of member states that have adopted the euro as their currency (countries. 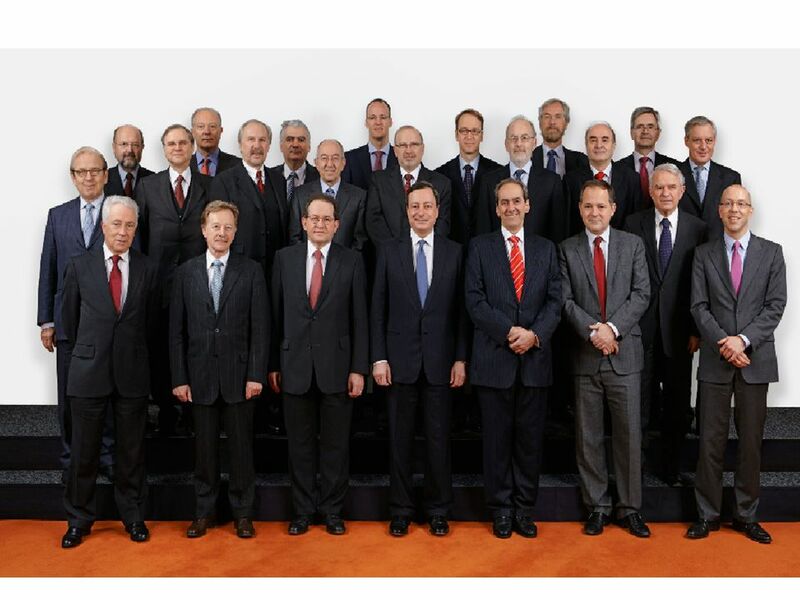 6 The Governing Council of the ECB The Governing Council of the ECB consists of the six members of the Executive Board and the governors of the euro area NCBs (16 governors in 2010). 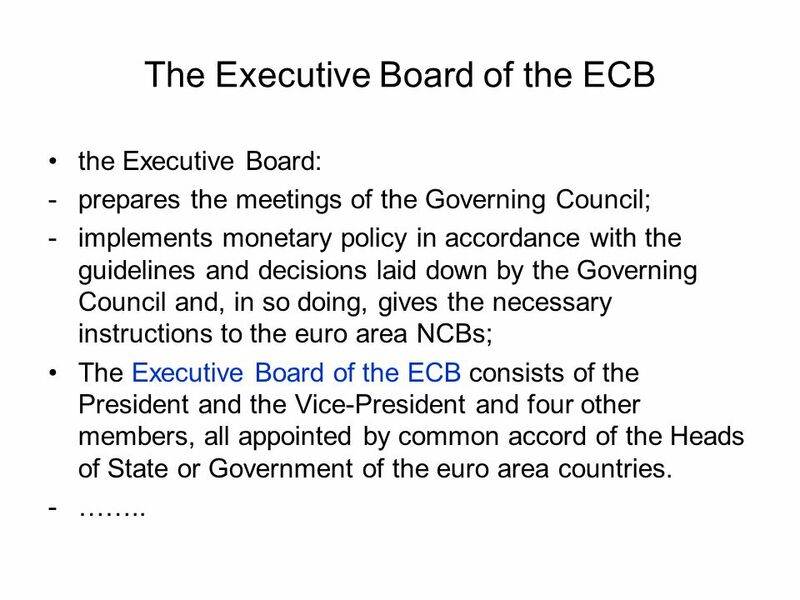 Both the Governing Council and the Executive Board are chaired by the President of the ECB or, in his absence, by the Vice-President. 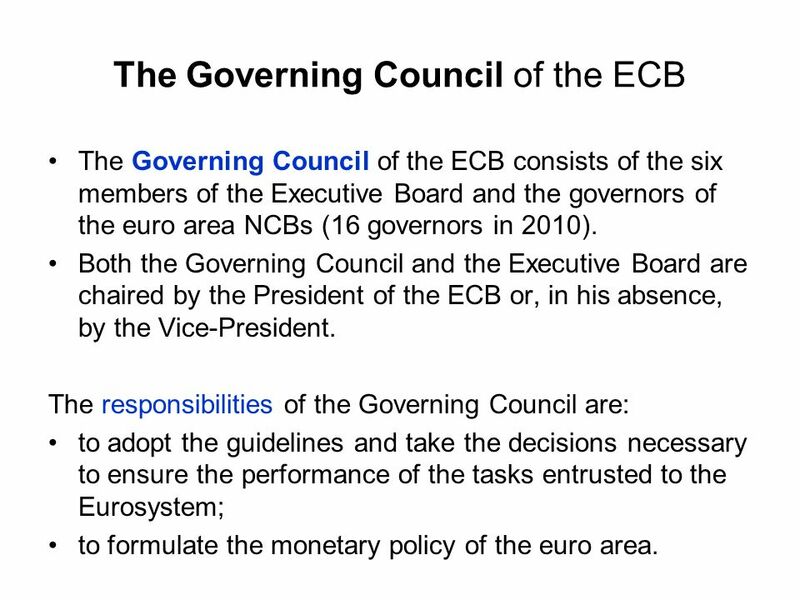 The responsibilities of the Governing Council are: to adopt the guidelines and take the decisions necessary to ensure the performance of the tasks entrusted to the Eurosystem; to formulate the monetary policy of the euro area. 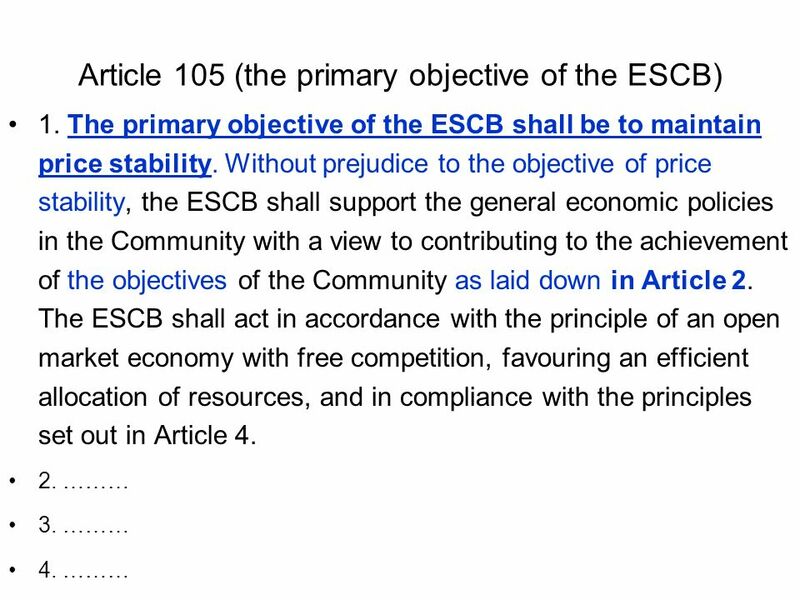 7 The Governing Council of the ECB The Statute of the ESCB states that the Governing Council shall act by a simple majority when taking decisions on monetary policy and on the other tasks of the Eurosystem. Each member of the Governing Council has one vote. 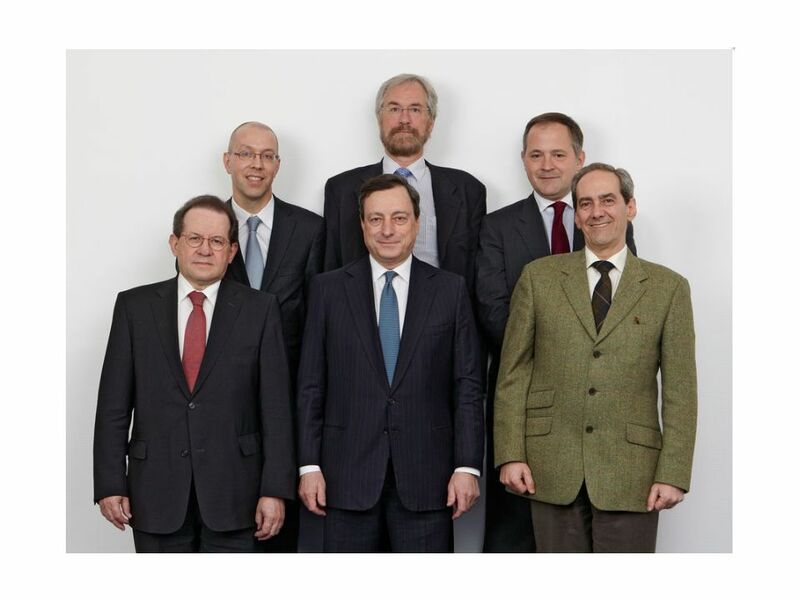 In the event of a tie, the President of the ECB has a casting vote. 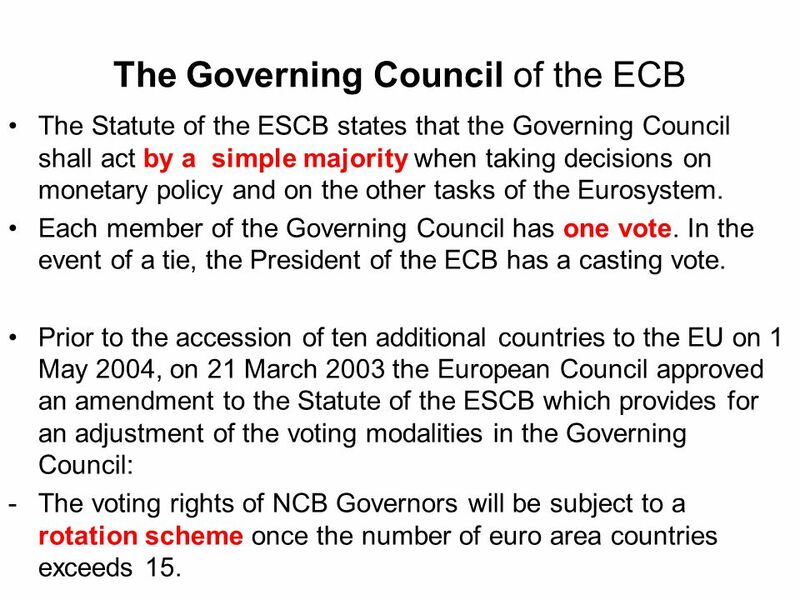 Prior to the accession of ten additional countries to the EU on 1 May 2004, on 21 March 2003 the European Council approved an amendment to the Statute of the ESCB which provides for an adjustment of the voting modalities in the Governing Council: -The voting rights of NCB Governors will be subject to a rotation scheme once the number of euro area countries exceeds 15. 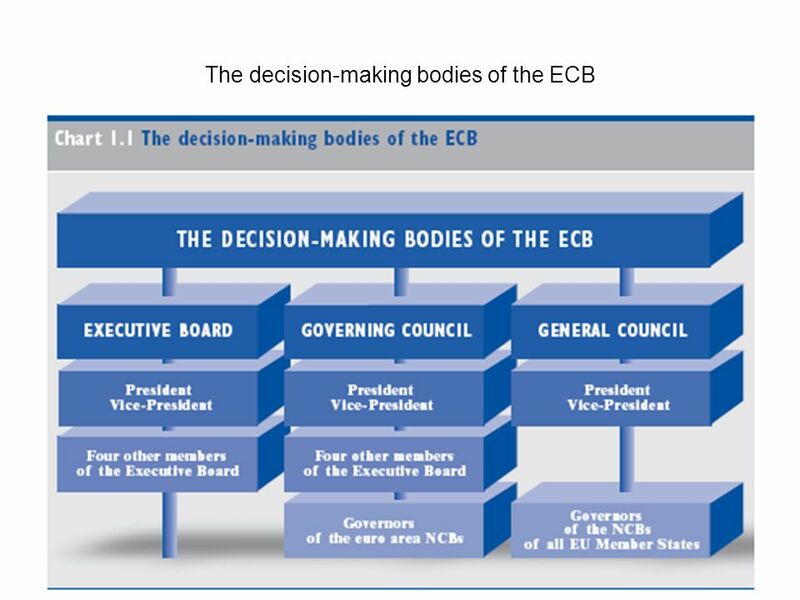 9 The Executive Board of the ECB the Executive Board: -prepares the meetings of the Governing Council; -implements monetary policy in accordance with the guidelines and decisions laid down by the Governing Council and, in so doing, gives the necessary instructions to the euro area NCBs; The Executive Board of the ECB consists of the President and the Vice-President and four other members, all appointed by common accord of the Heads of State or Government of the euro area countries. 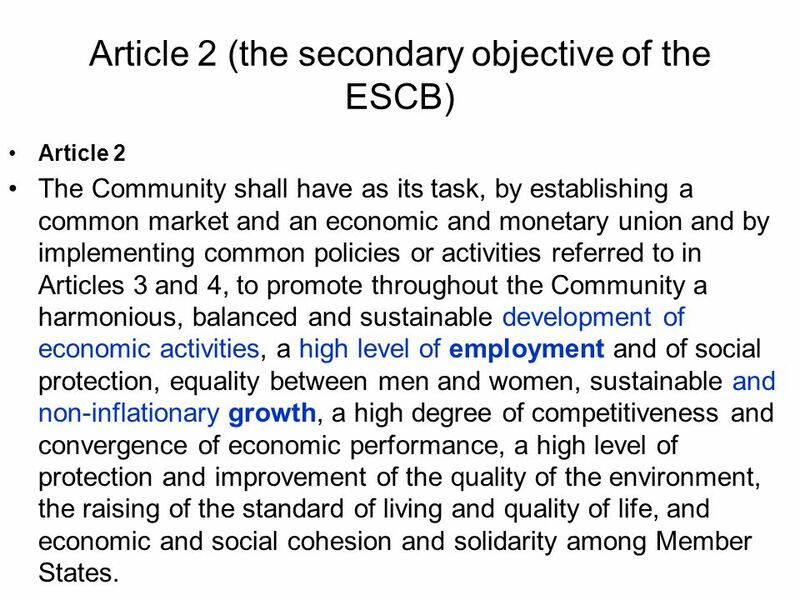 -……..
12 Article 2 (the secondary objective of the ESCB) Article 2 The Community shall have as its task, by establishing a common market and an economic and monetary union and by implementing common policies or activities referred to in Articles 3 and 4, to promote throughout the Community a harmonious, balanced and sustainable development of economic activities, a high level of employment and of social protection, equality between men and women, sustainable and non-inflationary growth, a high degree of competitiveness and convergence of economic performance, a high level of protection and improvement of the quality of the environment, the raising of the standard of living and quality of life, and economic and social cohesion and solidarity among Member States. 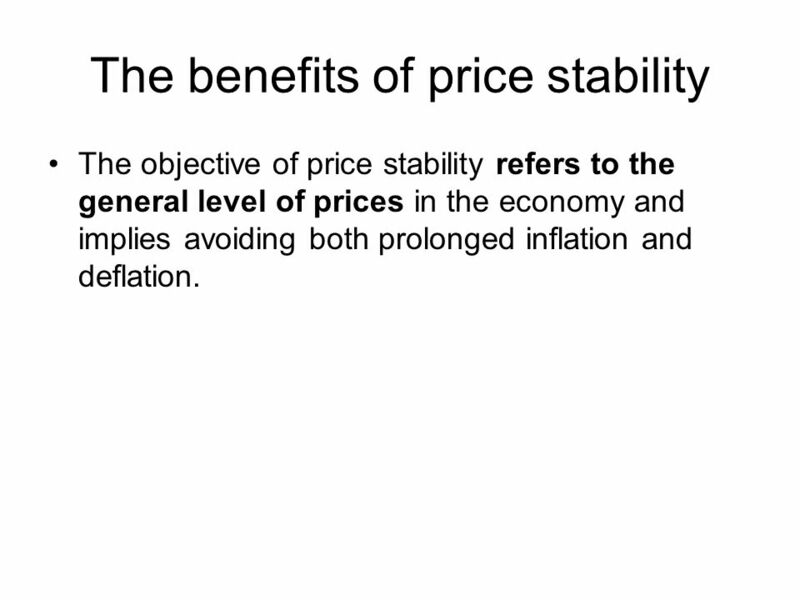 14 The benefits of price stability The objective of price stability refers to the general level of prices in the economy and implies avoiding both prolonged inflation and deflation. 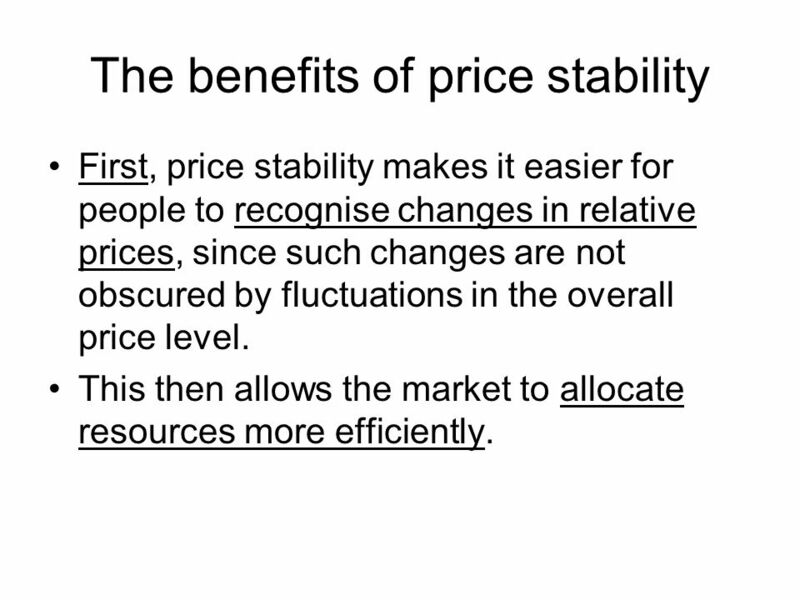 15 The benefits of price stability First, price stability makes it easier for people to recognise changes in relative prices, since such changes are not obscured by fluctuations in the overall price level. This then allows the market to allocate resources more efficiently. 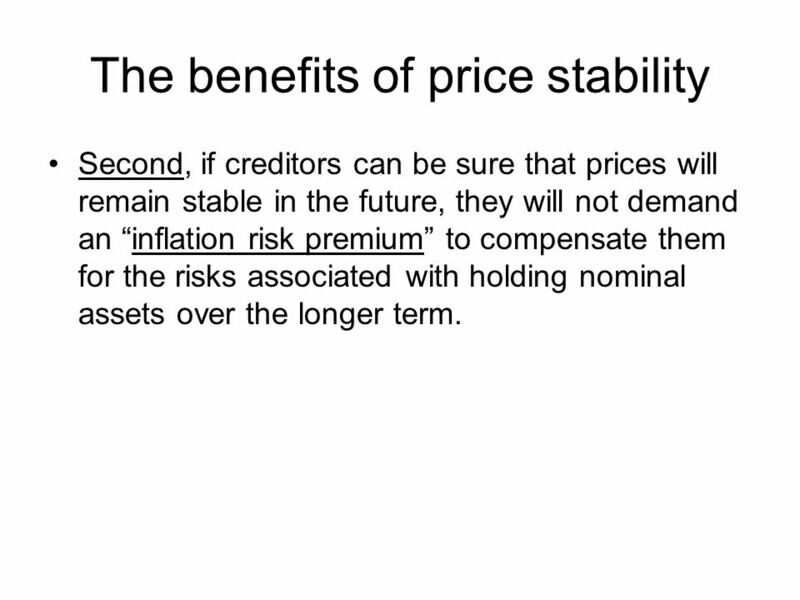 16 The benefits of price stability Second, if creditors can be sure that prices will remain stable in the future, they will not demand an inflation risk premium to compensate them for the risks associated with holding nominal assets over the longer term. 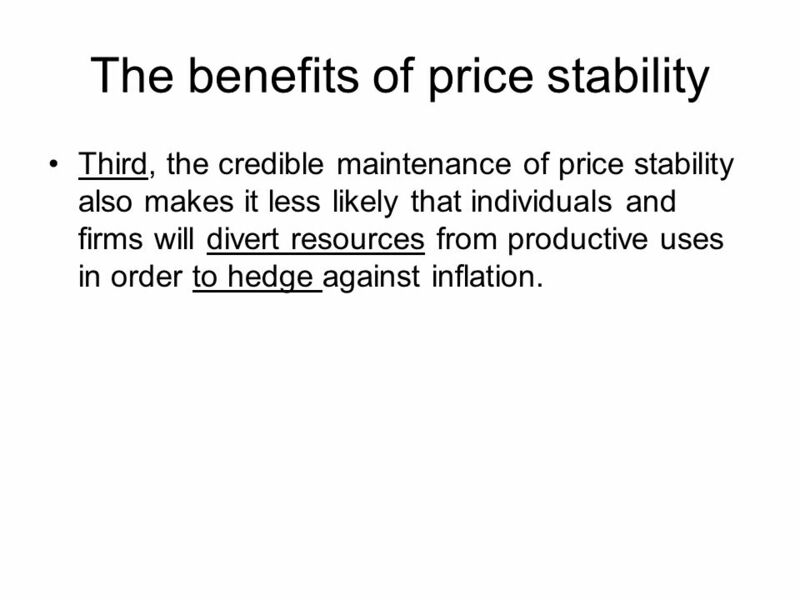 17 The benefits of price stability Third, the credible maintenance of price stability also makes it less likely that individuals and firms will divert resources from productive uses in order to hedge against inflation. 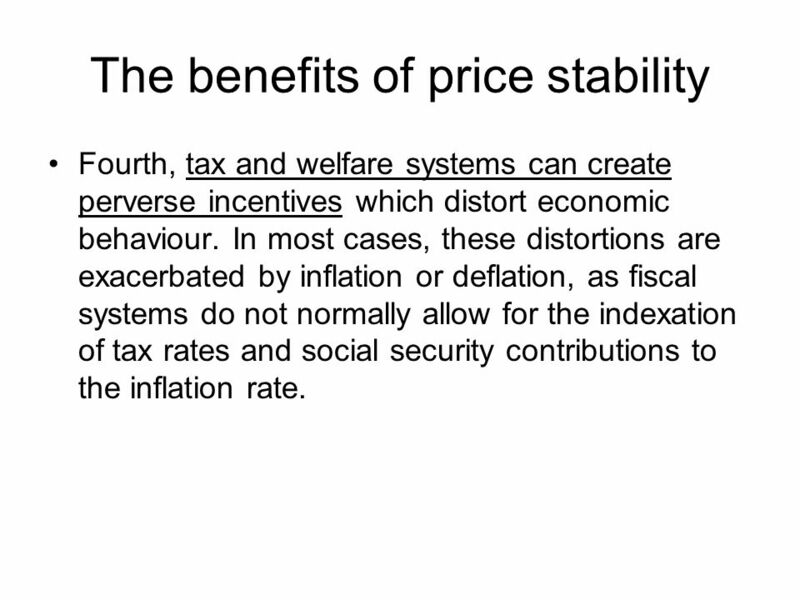 18 The benefits of price stability Fourth, tax and welfare systems can create perverse incentives which distort economic behaviour. 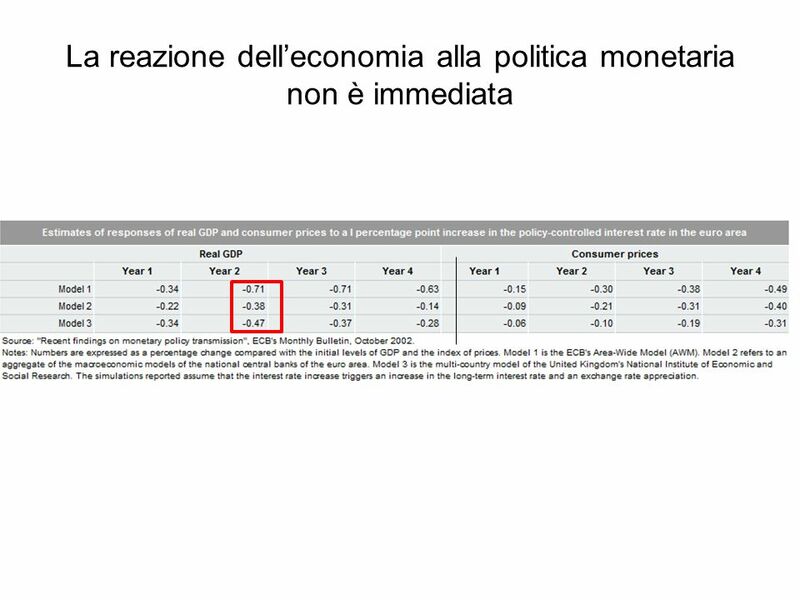 In most cases, these distortions are exacerbated by inflation or deflation, as fiscal systems do not normally allow for the indexation of tax rates and social security contributions to the inflation rate. 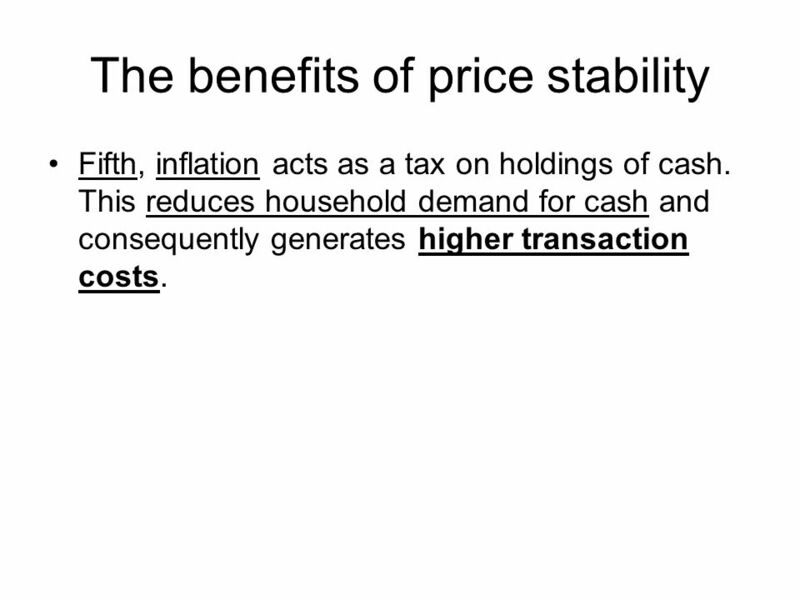 19 The benefits of price stability Fifth, inflation acts as a tax on holdings of cash. This reduces household demand for cash and consequently generates higher transaction costs. 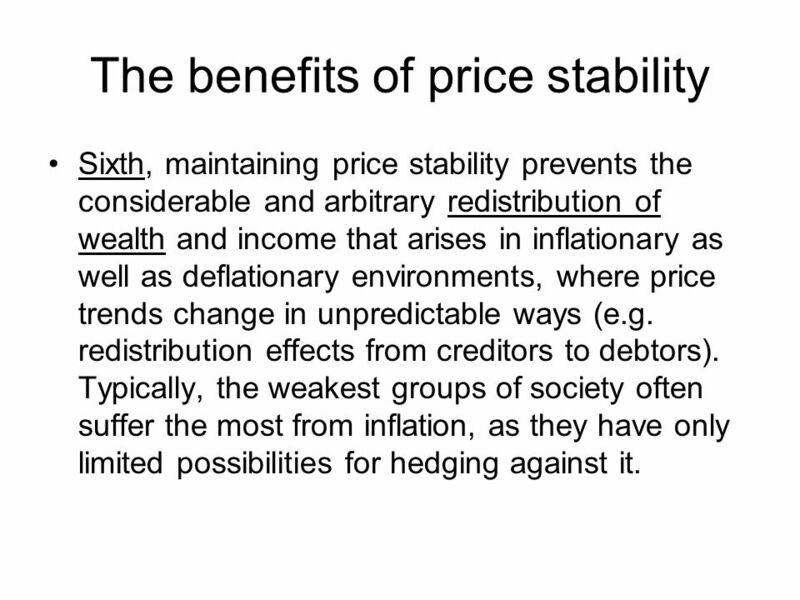 20 The benefits of price stability Sixth, maintaining price stability prevents the considerable and arbitrary redistribution of wealth and income that arises in inflationary as well as deflationary environments, where price trends change in unpredictable ways (e.g. redistribution effects from creditors to debtors). Typically, the weakest groups of society often suffer the most from inflation, as they have only limited possibilities for hedging against it. 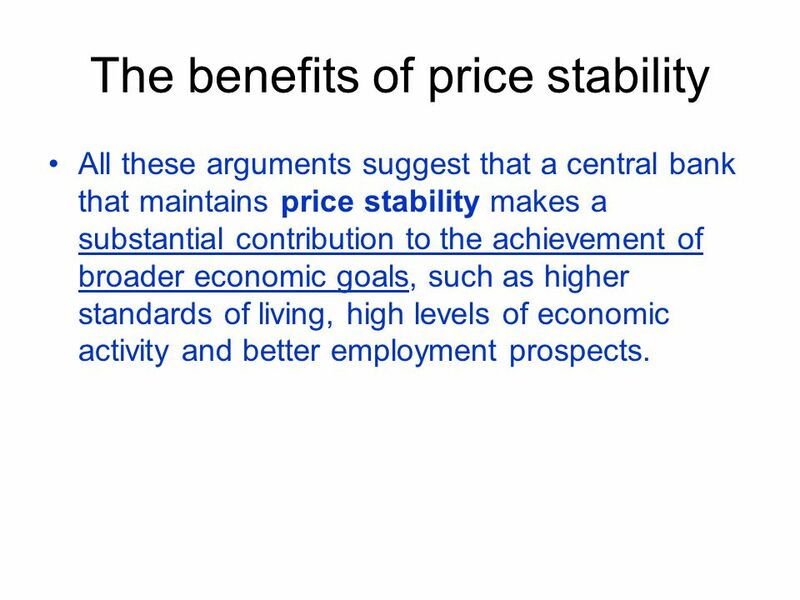 21 The benefits of price stability All these arguments suggest that a central bank that maintains price stability makes a substantial contribution to the achievement of broader economic goals, such as higher standards of living, high levels of economic activity and better employment prospects. 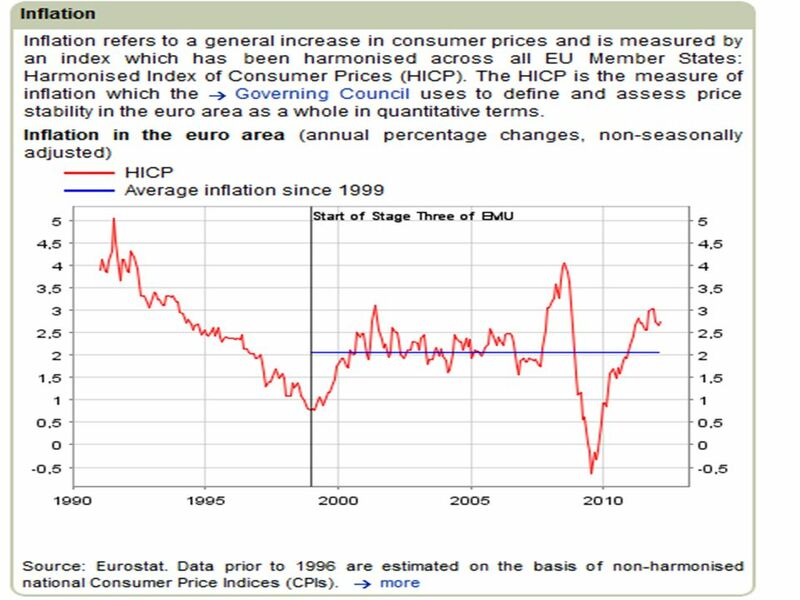 22 THE ECBS QUANTITATIVE DEFINITION OF PRICE STABILITY Price stability shall be defined as a year-on-year increase in the Harmonised Index of Consumer Prices (HICP) for the euro area of below 2%. 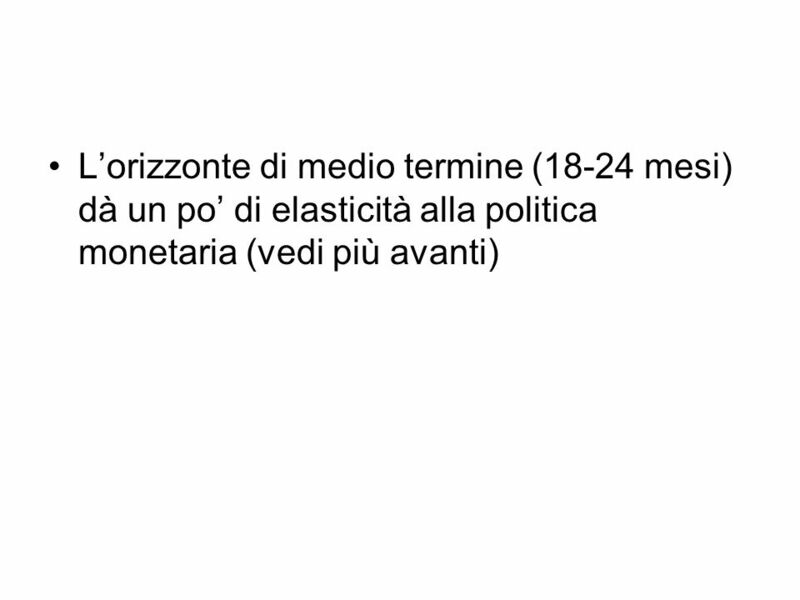 Price stability is to be maintained over the medium term (= circa 18-24 mesi) in 2003, the Governing Council further clarified that, within the definition, it aims to maintain inflation rates below but close to 2% over the medium term. 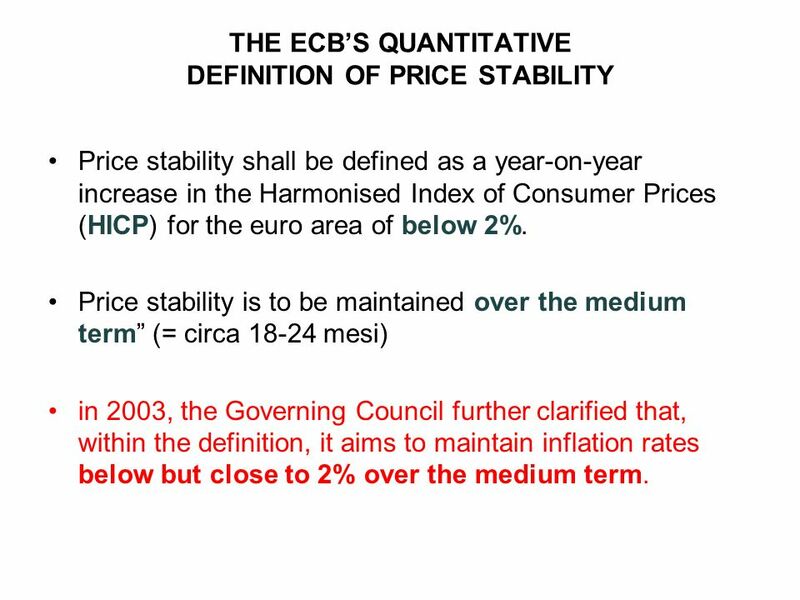 27 THE ECBS QUANTITATIVE DEFINITION OF PRICE STABILITY the definition helps to make the monetary policy framework easier to understand (i.e. it makes monetary policy more transparent). 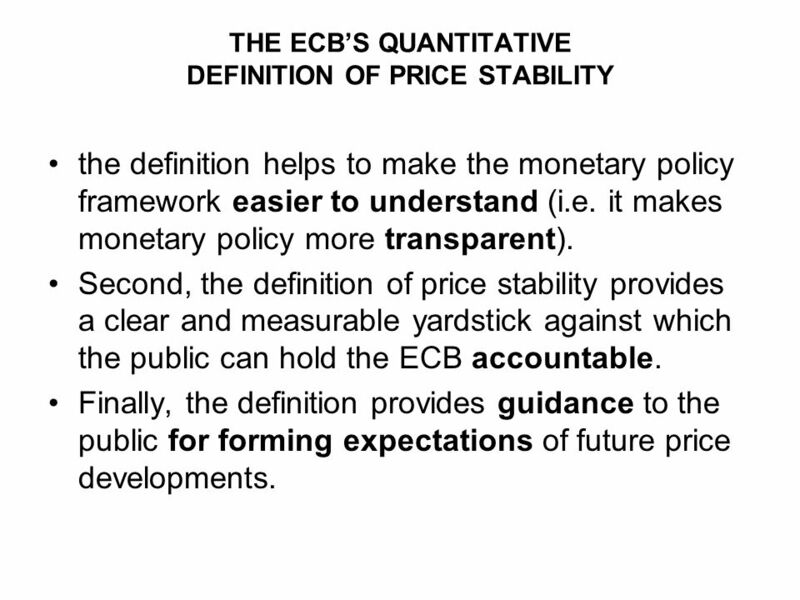 Second, the definition of price stability provides a clear and measurable yardstick against which the public can hold the ECB accountable. Finally, the definition provides guidance to the public for forming expectations of future price developments. 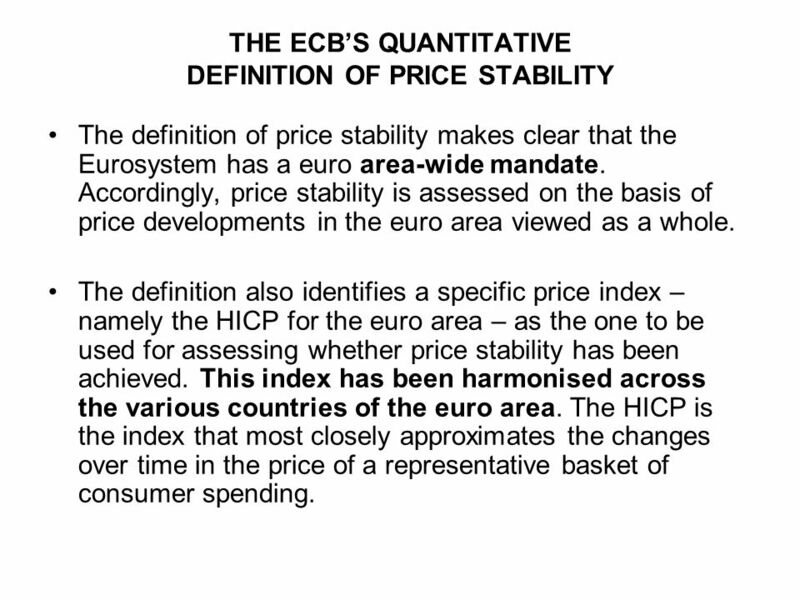 28 THE ECBS QUANTITATIVE DEFINITION OF PRICE STABILITY The definition of price stability makes clear that the Eurosystem has a euro area-wide mandate. 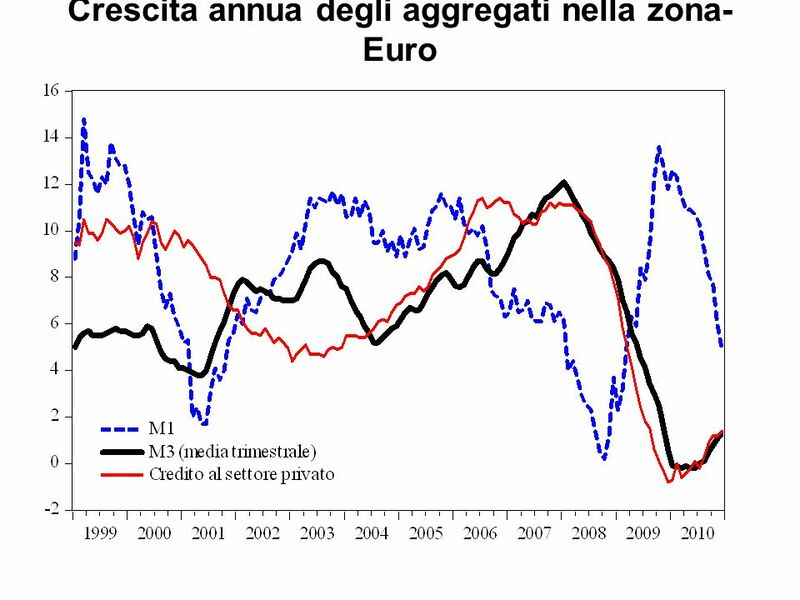 Accordingly, price stability is assessed on the basis of price developments in the euro area viewed as a whole. The definition also identifies a specific price index – namely the HICP for the euro area – as the one to be used for assessing whether price stability has been achieved. This index has been harmonised across the various countries of the euro area. The HICP is the index that most closely approximates the changes over time in the price of a representative basket of consumer spending. 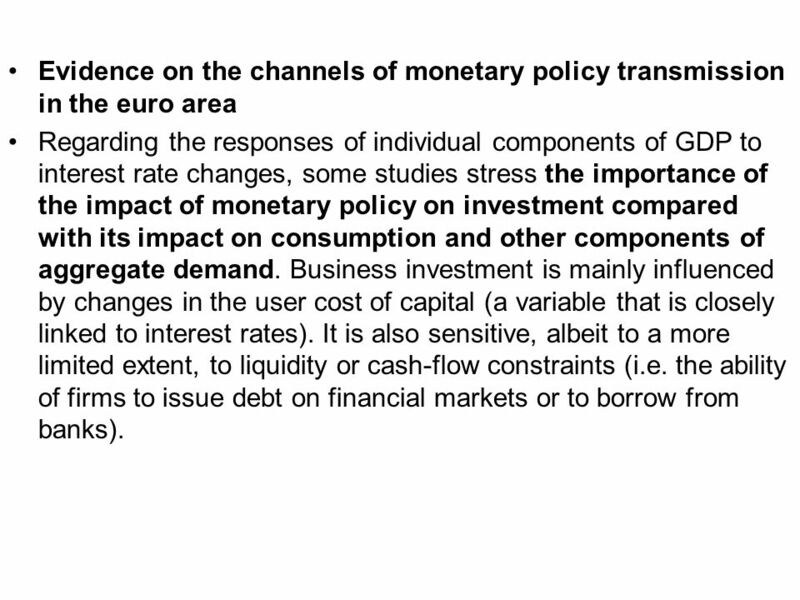 34 Evidence on the channels of monetary policy transmission in the euro area Regarding the responses of individual components of GDP to interest rate changes, some studies stress the importance of the impact of monetary policy on investment compared with its impact on consumption and other components of aggregate demand. Business investment is mainly influenced by changes in the user cost of capital (a variable that is closely linked to interest rates). It is also sensitive, albeit to a more limited extent, to liquidity or cash-flow constraints (i.e. the ability of firms to issue debt on financial markets or to borrow from banks). 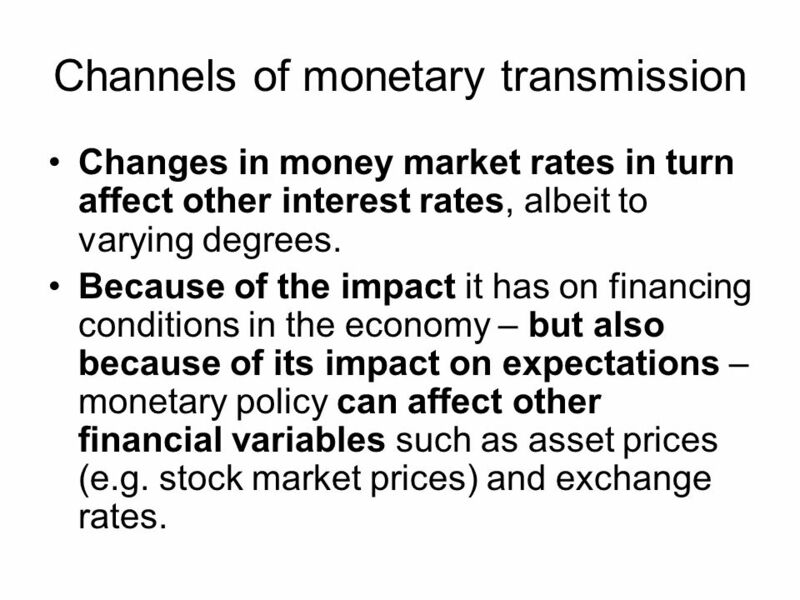 36 Channels of monetary transmission The (long) chain of cause and effect linking monetary policy decisions with the price level starts with a change in the official interest rates set by the central bank on its own operations. In these operations, the central bank typically provides funds to banks Through this process, the central bank can exert a dominant influence on money market conditions and thereby steer money market interest rates. 37 Channels of monetary transmission Changes in money market rates in turn affect other interest rates, albeit to varying degrees. 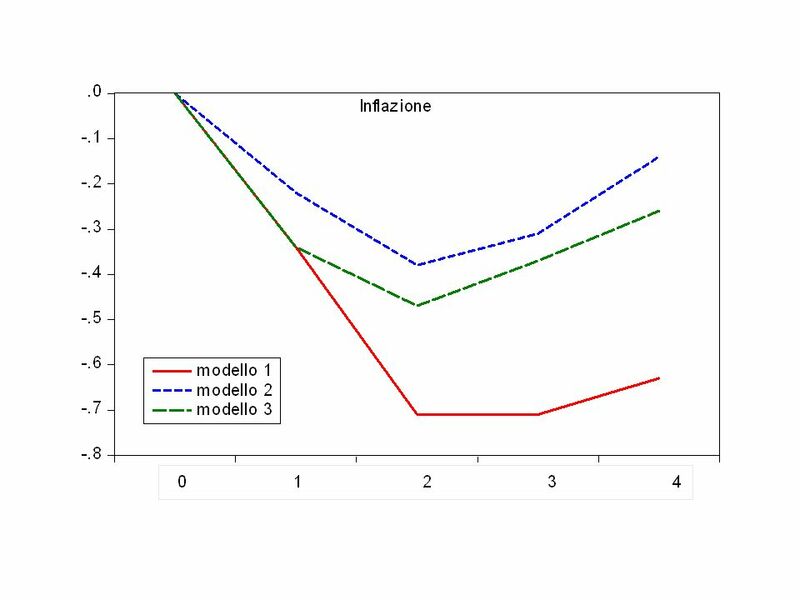 Because of the impact it has on financing conditions in the economy – but also because of its impact on expectations – monetary policy can affect other financial variables such as asset prices (e.g. stock market prices) and exchange rates. 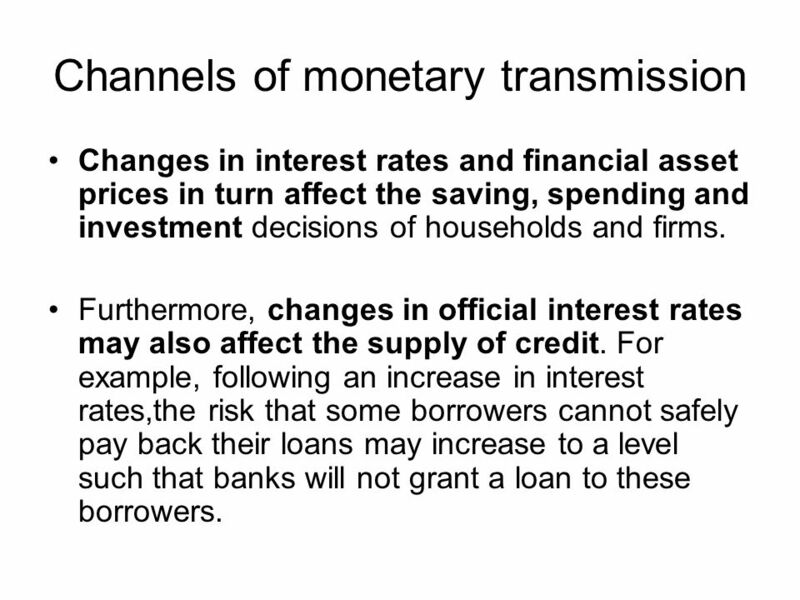 38 Channels of monetary transmission Changes in interest rates and financial asset prices in turn affect the saving, spending and investment decisions of households and firms. Furthermore, changes in official interest rates may also affect the supply of credit. For example, following an increase in interest rates,the risk that some borrowers cannot safely pay back their loans may increase to a level such that banks will not grant a loan to these borrowers. 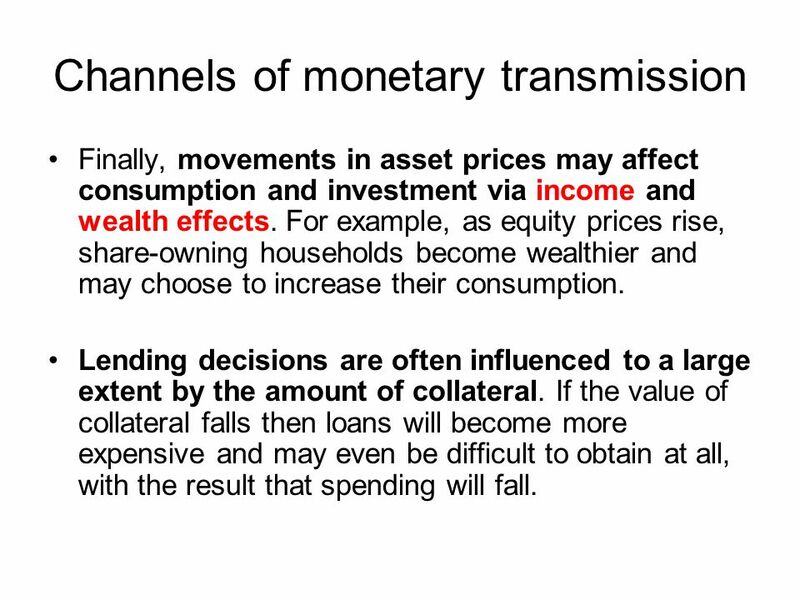 39 Channels of monetary transmission Finally, movements in asset prices may affect consumption and investment via income and wealth effects. For example, as equity prices rise, share-owning households become wealthier and may choose to increase their consumption. Lending decisions are often influenced to a large extent by the amount of collateral. If the value of collateral falls then loans will become more expensive and may even be difficult to obtain at all, with the result that spending will fall. 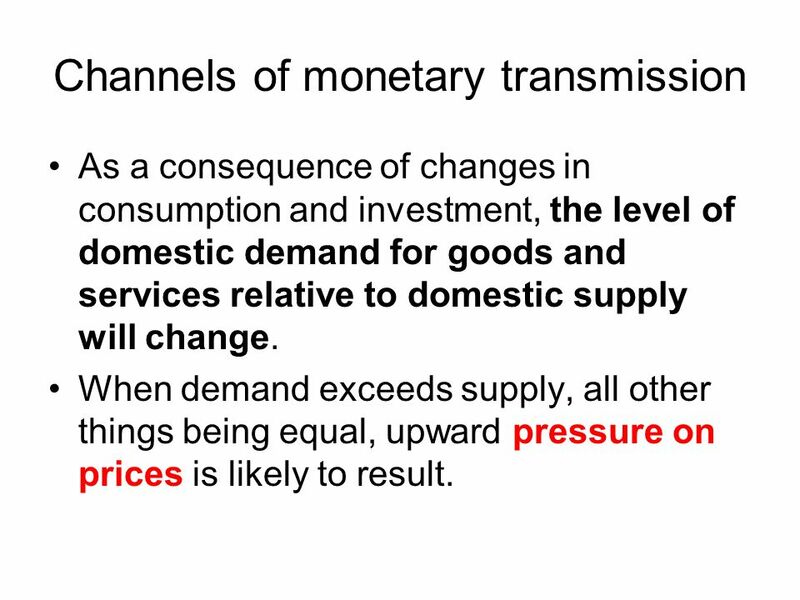 40 Channels of monetary transmission As a consequence of changes in consumption and investment, the level of domestic demand for goods and services relative to domestic supply will change. When demand exceeds supply, all other things being equal, upward pressure on prices is likely to result. 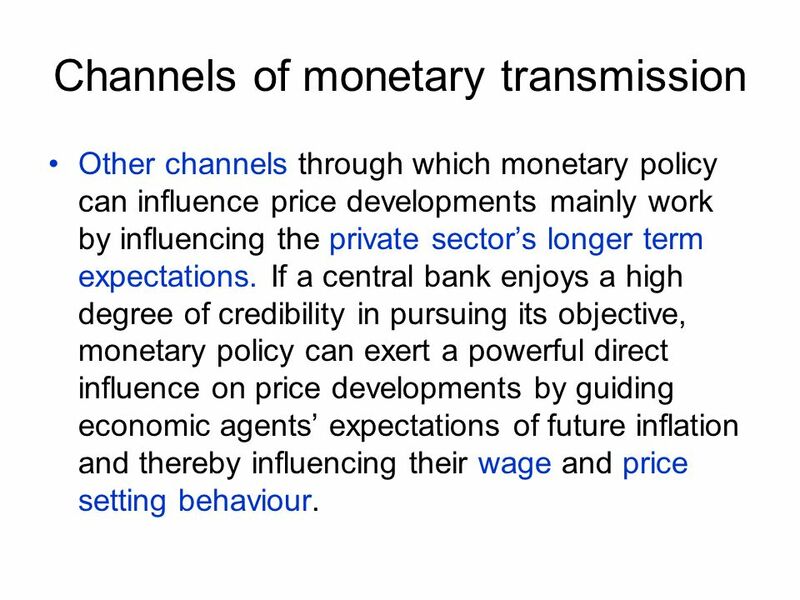 41 Channels of monetary transmission Other channels through which monetary policy can influence price developments mainly work by influencing the private sectors longer term expectations. 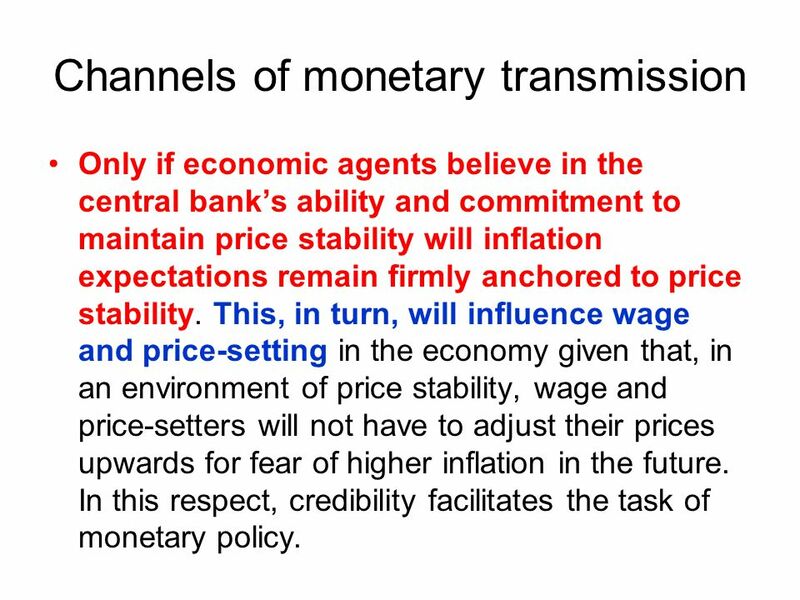 If a central bank enjoys a high degree of credibility in pursuing its objective, monetary policy can exert a powerful direct influence on price developments by guiding economic agents expectations of future inflation and thereby influencing their wage and price setting behaviour. 42 Channels of monetary transmission Only if economic agents believe in the central banks ability and commitment to maintain price stability will inflation expectations remain firmly anchored to price stability. This, in turn, will influence wage and price-setting in the economy given that, in an environment of price stability, wage and price-setters will not have to adjust their prices upwards for fear of higher inflation in the future. 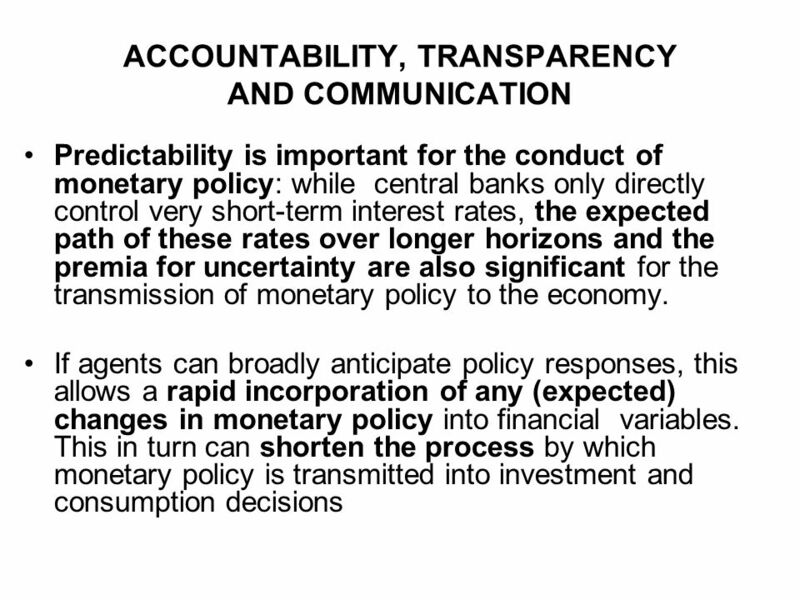 In this respect, credibility facilitates the task of monetary policy. 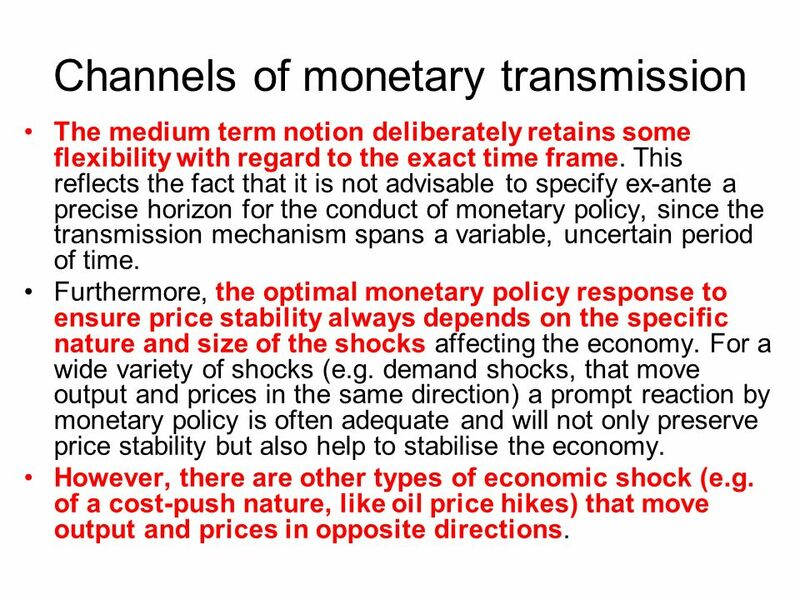 44 Channels of monetary transmission Monetary policy cannot, and therefore should not attempt to, fine-tune developments in prices or inflation over short horizons of a few weeks or months. 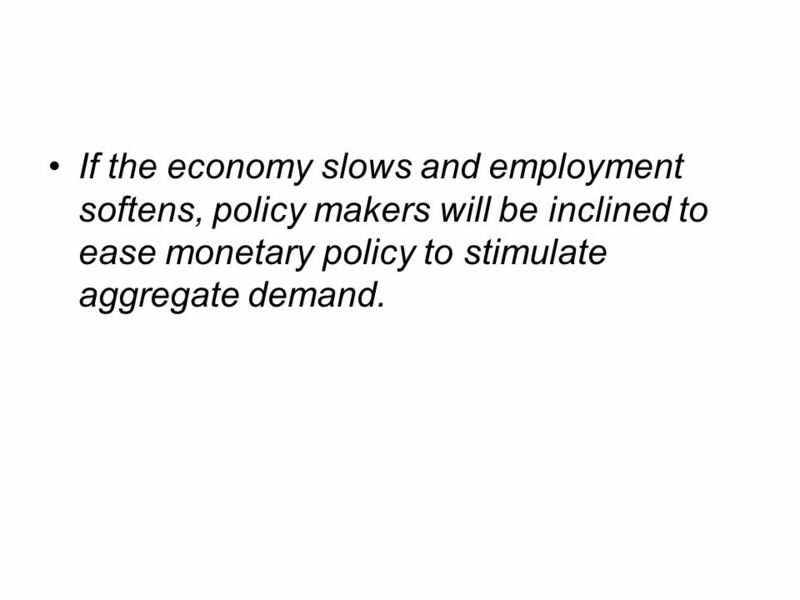 Changes in monetary policy only affect prices with a time lag, and the magnitude of the eventual impact is uncertain. This implies that monetary policy cannot offset all unanticipated disturbances to the price level. Some short- term volatility in inflation is therefore inevitable. 45 Channels of monetary transmission The medium term notion deliberately retains some flexibility with regard to the exact time frame. 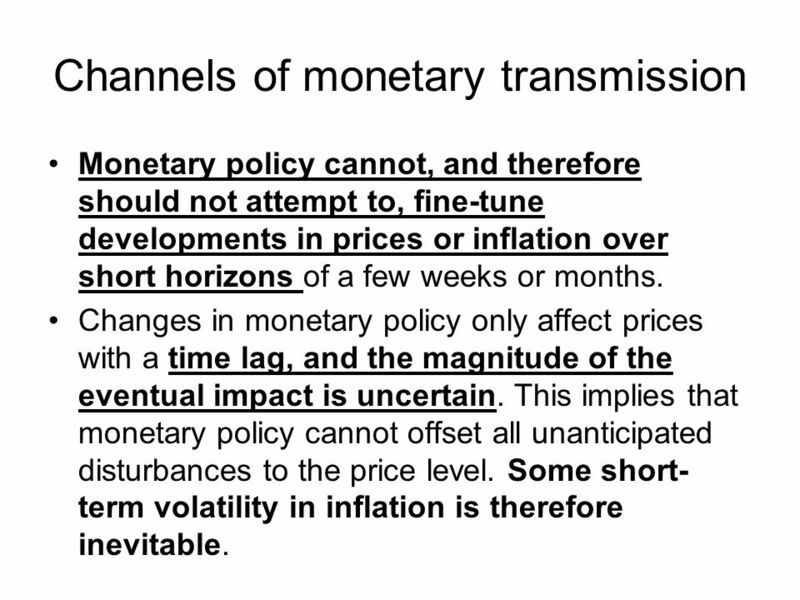 This reflects the fact that it is not advisable to specify ex-ante a precise horizon for the conduct of monetary policy, since the transmission mechanism spans a variable, uncertain period of time. Furthermore, the optimal monetary policy response to ensure price stability always depends on the specific nature and size of the shocks affecting the economy. For a wide variety of shocks (e.g. demand shocks, that move output and prices in the same direction) a prompt reaction by monetary policy is often adequate and will not only preserve price stability but also help to stabilise the economy. However, there are other types of economic shock (e.g. 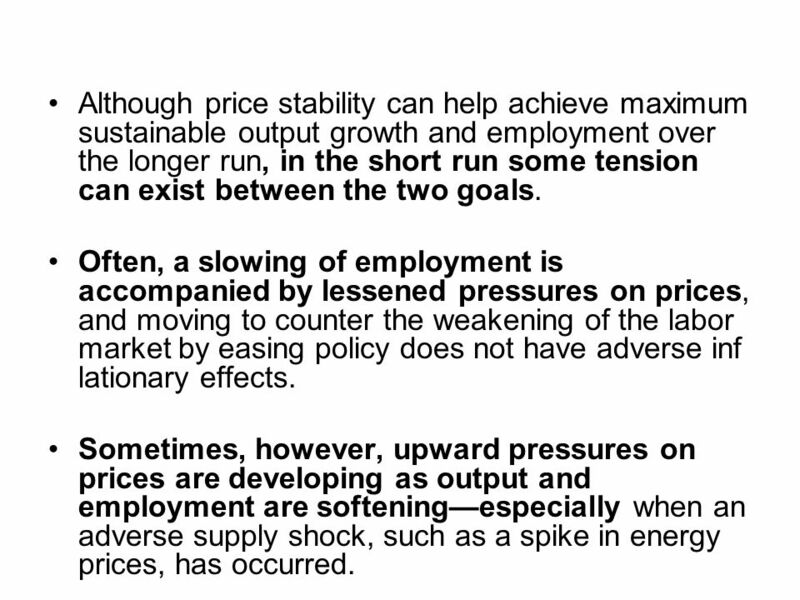 of a cost-push nature, like oil price hikes) that move output and prices in opposite directions. 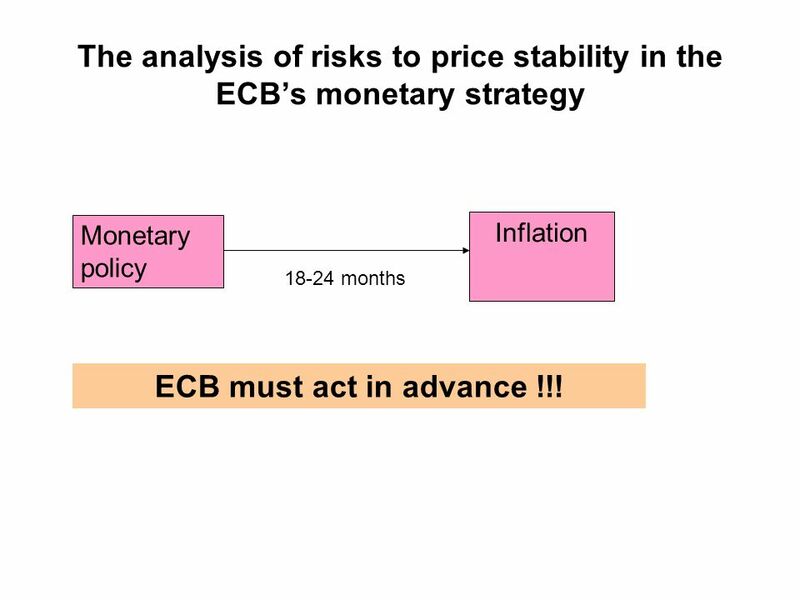 46 The analysis of risks to price stability in the ECBs monetary strategy Monetary policy Inflation 18-24 months ECB must act in advance !!! 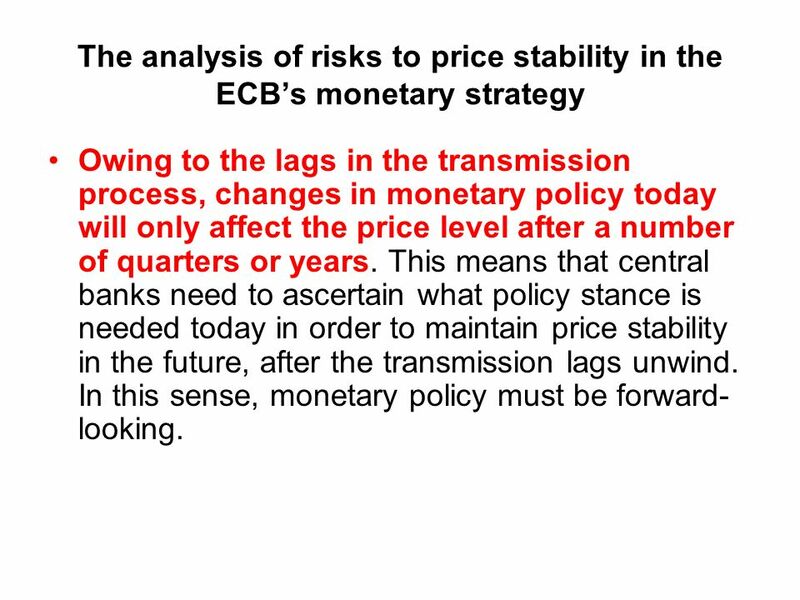 47 The analysis of risks to price stability in the ECBs monetary strategy Owing to the lags in the transmission process, changes in monetary policy today will only affect the price level after a number of quarters or years. This means that central banks need to ascertain what policy stance is needed today in order to maintain price stability in the future, after the transmission lags unwind. In this sense, monetary policy must be forward- looking. 48 The analysis of risks to price stability in the ECBs monetary strategy As the transmission lags make it impossible in the short run for monetary policy to offset unanticipated shocks to the price level In addition,owing to the complexity of the transmission process, there is always a large element of uncertainty surrounding the effects of monetary policy. For these reasons, monetary policy should have a medium-term orientation in order to avoid excessive activism and the introduction of unnecessary volatility into the real economy. 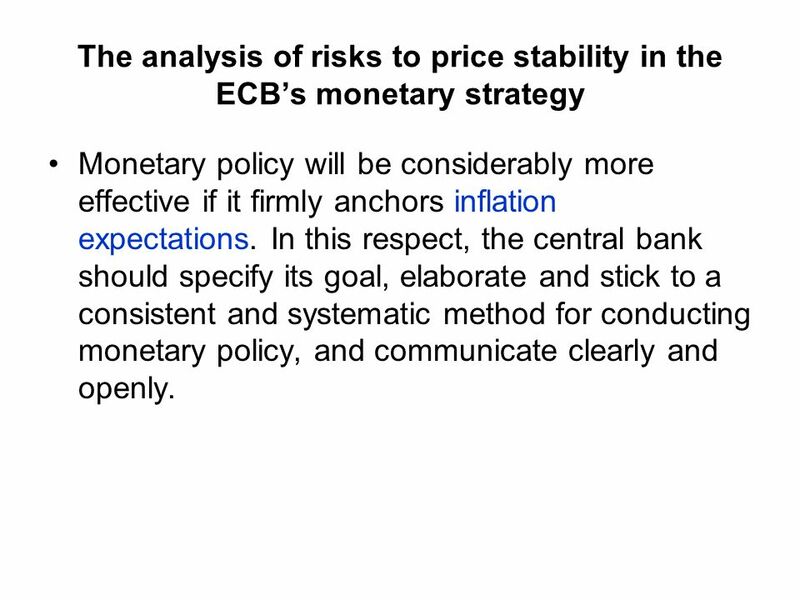 49 The analysis of risks to price stability in the ECBs monetary strategy Monetary policy will be considerably more effective if it firmly anchors inflation expectations. 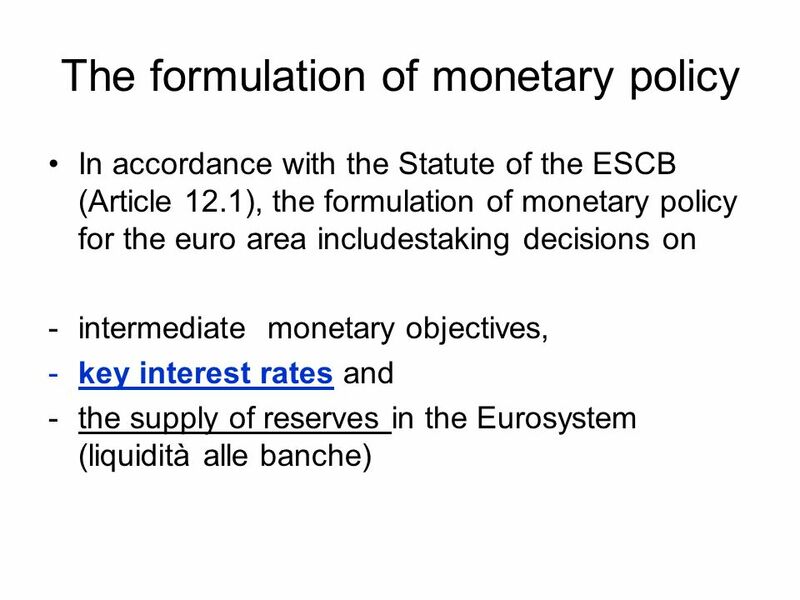 In this respect, the central bank should specify its goal, elaborate and stick to a consistent and systematic method for conducting monetary policy, and communicate clearly and openly. 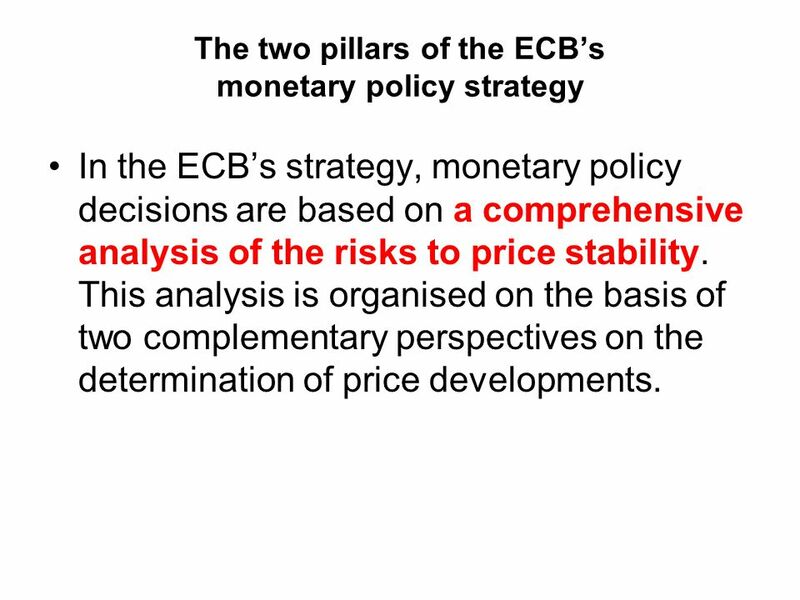 50 The two pillars of the ECBs monetary policy strategy In the ECBs strategy, monetary policy decisions are based on a comprehensive analysis of the risks to price stability. This analysis is organised on the basis of two complementary perspectives on the determination of price developments. 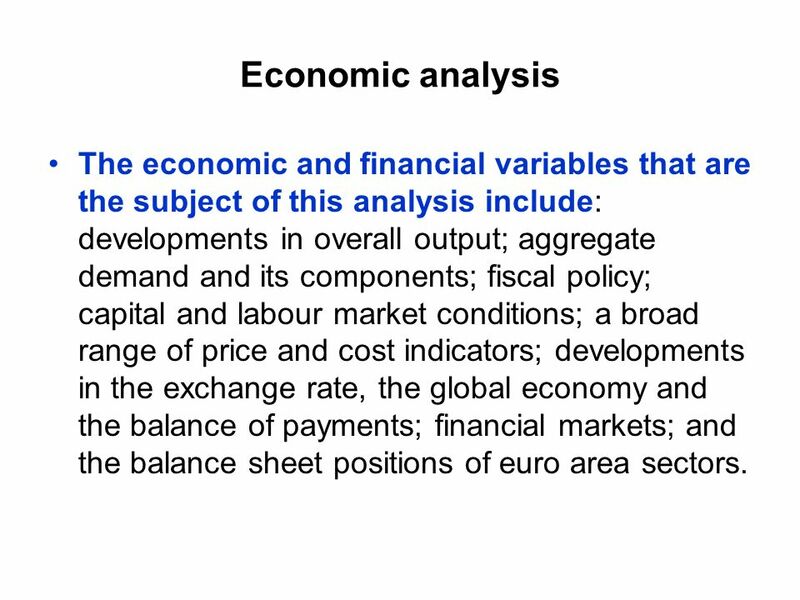 53 Economic analysis The economic and financial variables that are the subject of this analysis include: developments in overall output; aggregate demand and its components; fiscal policy; capital and labour market conditions; a broad range of price and cost indicators; developments in the exchange rate, the global economy and the balance of payments; financial markets; and the balance sheet positions of euro area sectors. 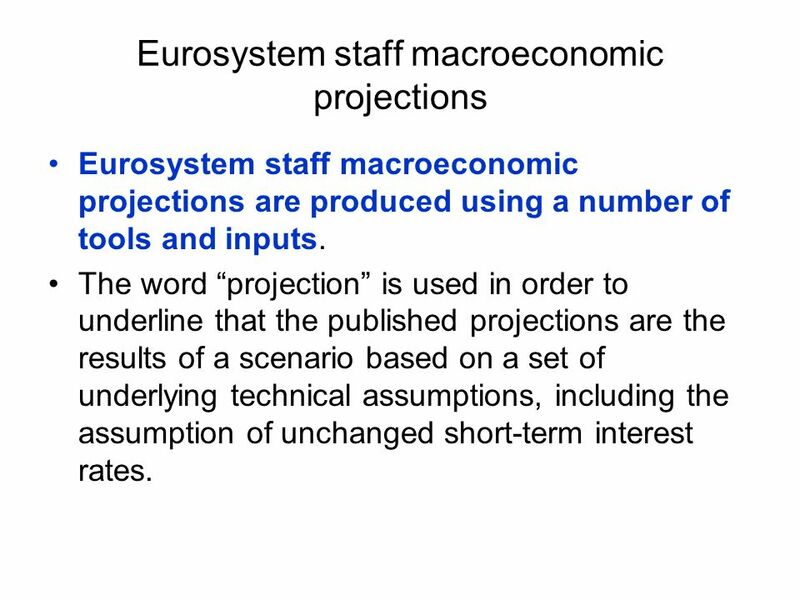 54 Eurosystem staff macroeconomic projections Eurosystem staff macroeconomic projections are produced using a number of tools and inputs. 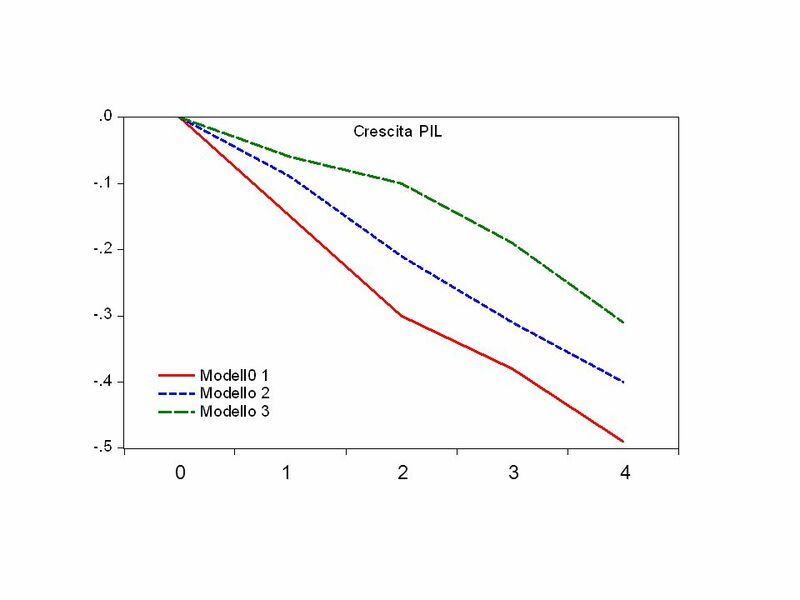 The word projection is used in order to underline that the published projections are the results of a scenario based on a set of underlying technical assumptions, including the assumption of unchanged short-term interest rates. 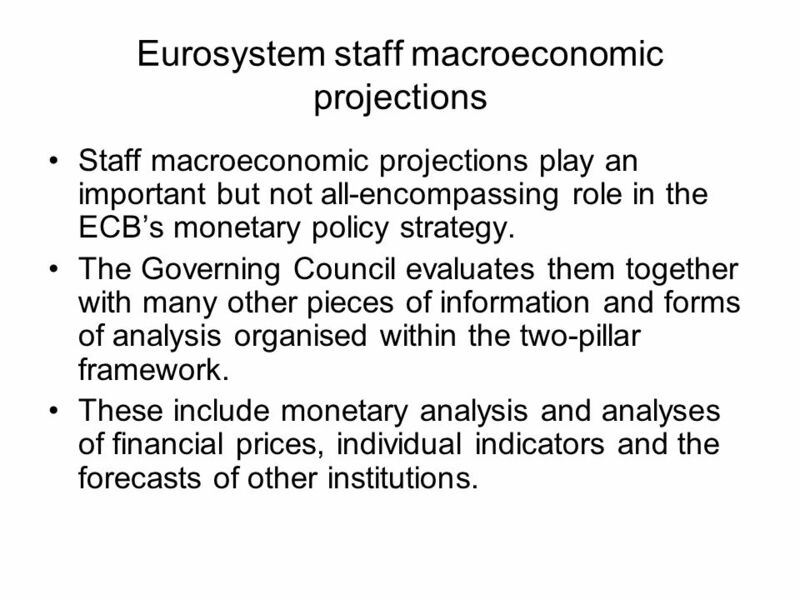 55 Eurosystem staff macroeconomic projections Staff macroeconomic projections play an important but not all-encompassing role in the ECBs monetary policy strategy. The Governing Council evaluates them together with many other pieces of information and forms of analysis organised within the two-pillar framework. These include monetary analysis and analyses of financial prices, individual indicators and the forecasts of other institutions. 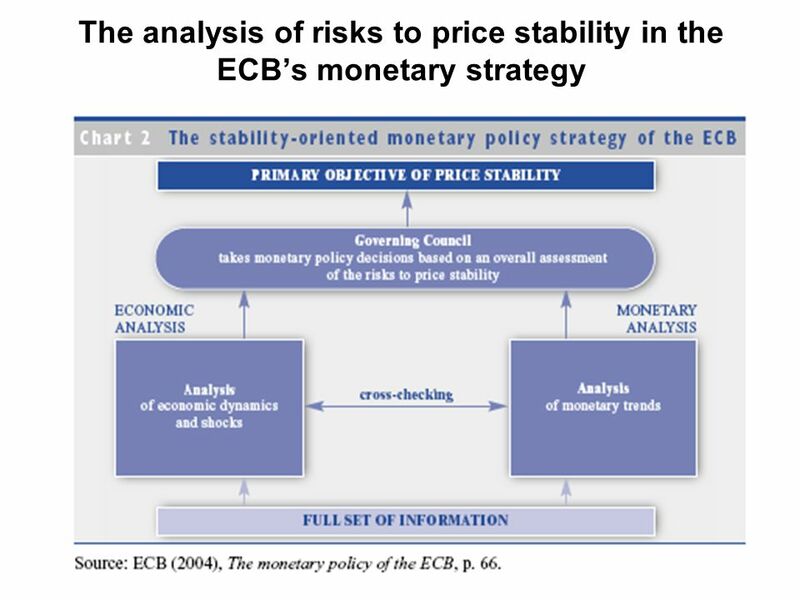 57 Monetary Analysis The ECB singles out money from within the set of selected key indicators that it monitors and studies closely. This decision was made in recognition of the fact that monetary growth and inflation are closely related in the medium to long run. 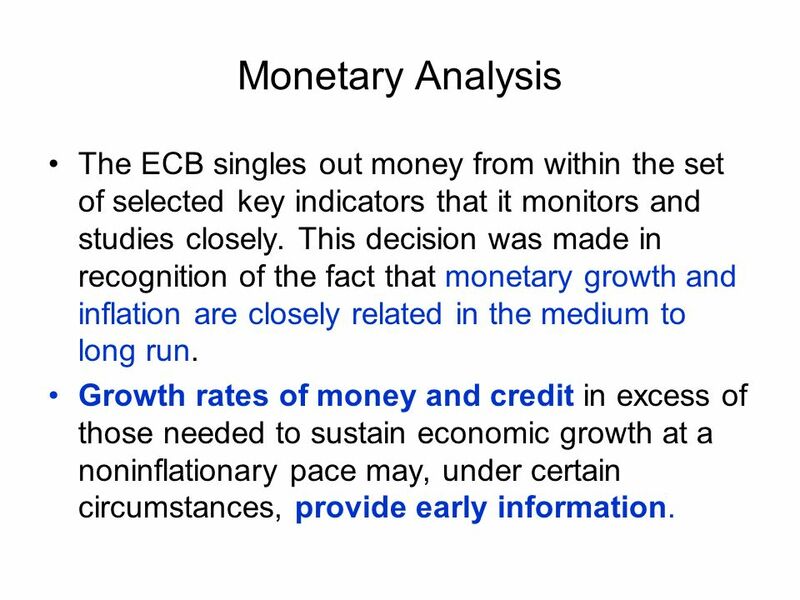 Growth rates of money and credit in excess of those needed to sustain economic growth at a noninflationary pace may, under certain circumstances, provide early information. 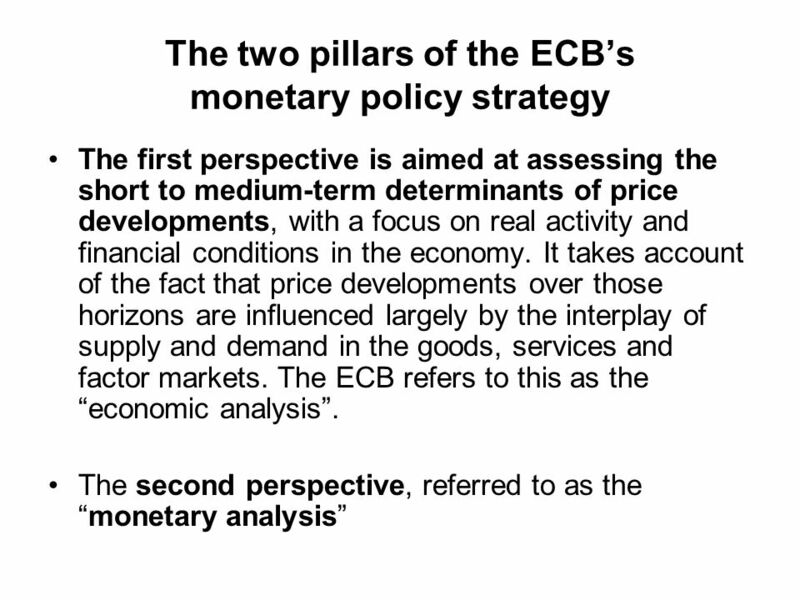 59 Cross-checking information from the two pillars Regarding the Governing Councils decisions on the appropriate stance of monetary policy, the two-pillar approach provides a cross-check of the indications that stem from the shorterterm economic analysis with those from the longer-term monetary analysis. 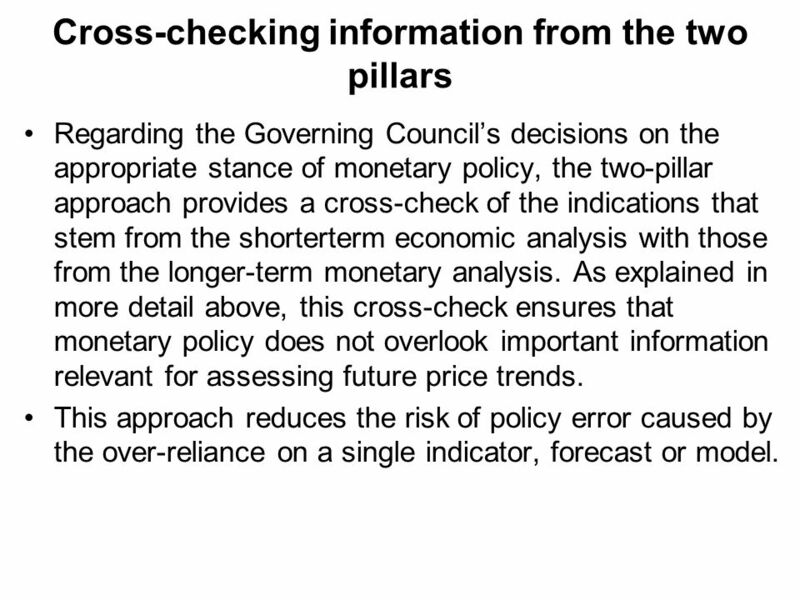 As explained in more detail above, this cross-check ensures that monetary policy does not overlook important information relevant for assessing future price trends. 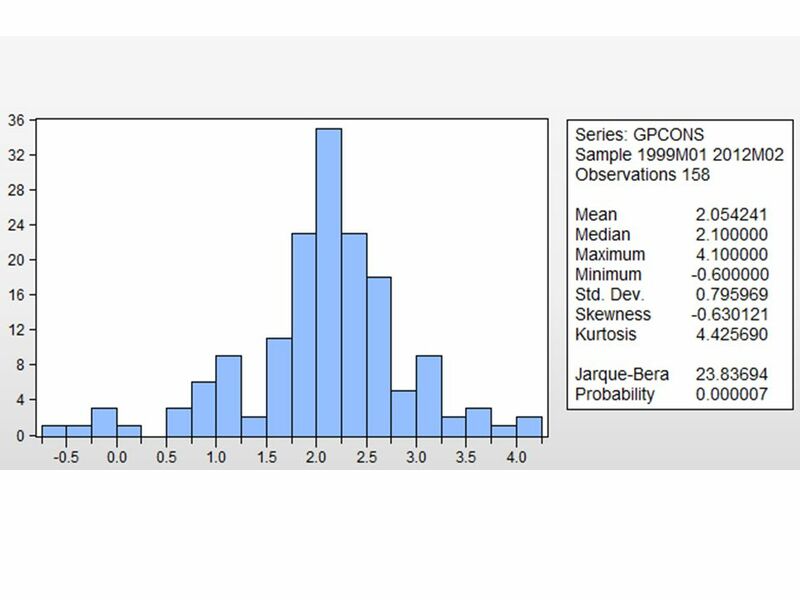 This approach reduces the risk of policy error caused by the over-reliance on a single indicator, forecast or model. 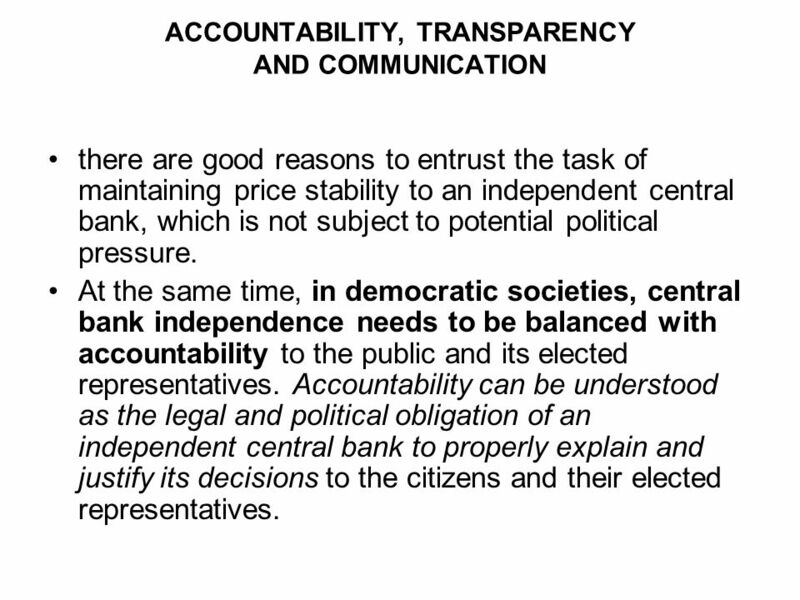 60 ACCOUNTABILITY, TRANSPARENCY AND COMMUNICATION there are good reasons to entrust the task of maintaining price stability to an independent central bank, which is not subject to potential political pressure. At the same time, in democratic societies, central bank independence needs to be balanced with accountability to the public and its elected representatives. Accountability can be understood as the legal and political obligation of an independent central bank to properly explain and justify its decisions to the citizens and their elected representatives. 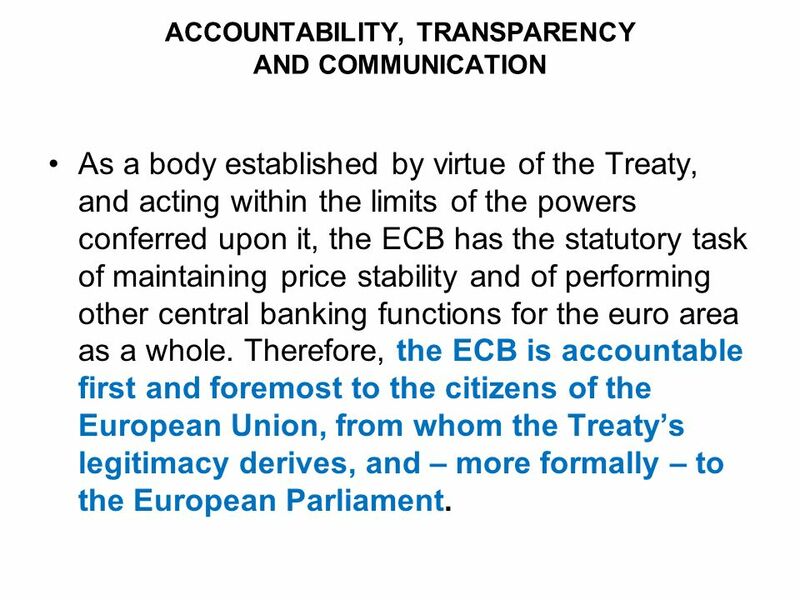 61 ACCOUNTABILITY, TRANSPARENCY AND COMMUNICATION As a body established by virtue of the Treaty, and acting within the limits of the powers conferred upon it, the ECB has the statutory task of maintaining price stability and of performing other central banking functions for the euro area as a whole. 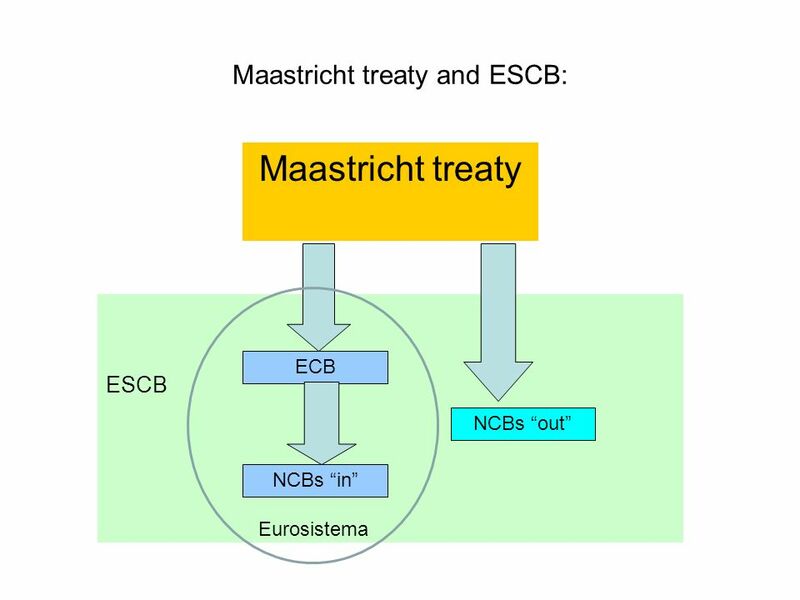 Therefore, the ECB is accountable first and foremost to the citizens of the European Union, from whom the Treatys legitimacy derives, and – more formally – to the European Parliament. 62 ACCOUNTABILITY, TRANSPARENCY AND COMMUNICATION Transparency can be defined as an environment in which the central bank provides the general public and the markets with all relevant information on its strategy, assessments and policy decisions as well as its procedures, and does so in an open, clear and timely manner. 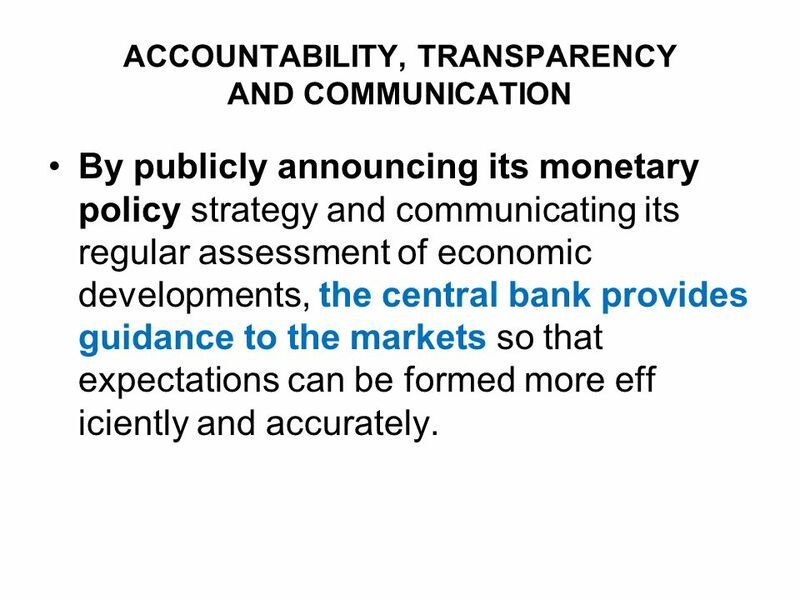 63 ACCOUNTABILITY, TRANSPARENCY AND COMMUNICATION This helps the public to monitor and evaluate the central banks performance. being clear about its mandate and how it goes about fulfilling it helps a central bank to foster credibility. 64 ACCOUNTABILITY, TRANSPARENCY AND COMMUNICATION By publicly announcing its monetary policy strategy and communicating its regular assessment of economic developments, the central bank provides guidance to the markets so that expectations can be formed more eff iciently and accurately. 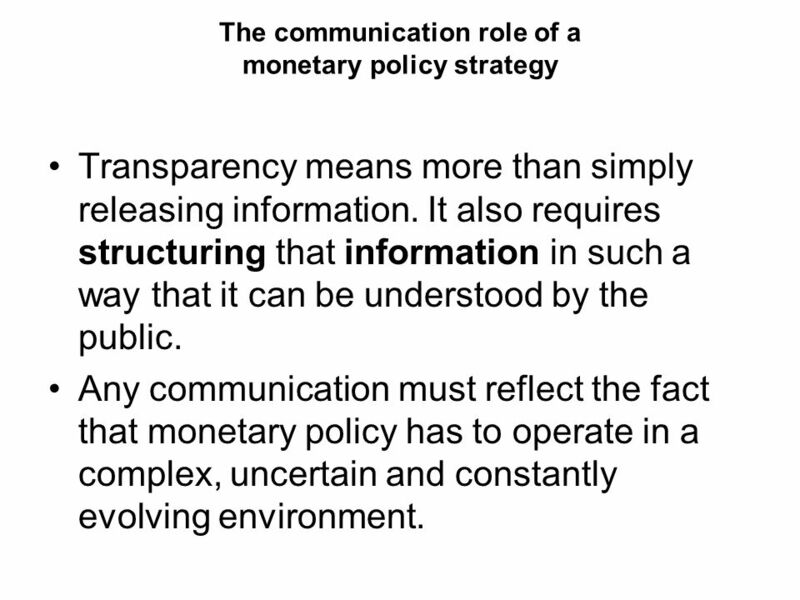 66 The communication role of a monetary policy strategy Transparency means more than simply releasing information. It also requires structuring that information in such a way that it can be understood by the public. 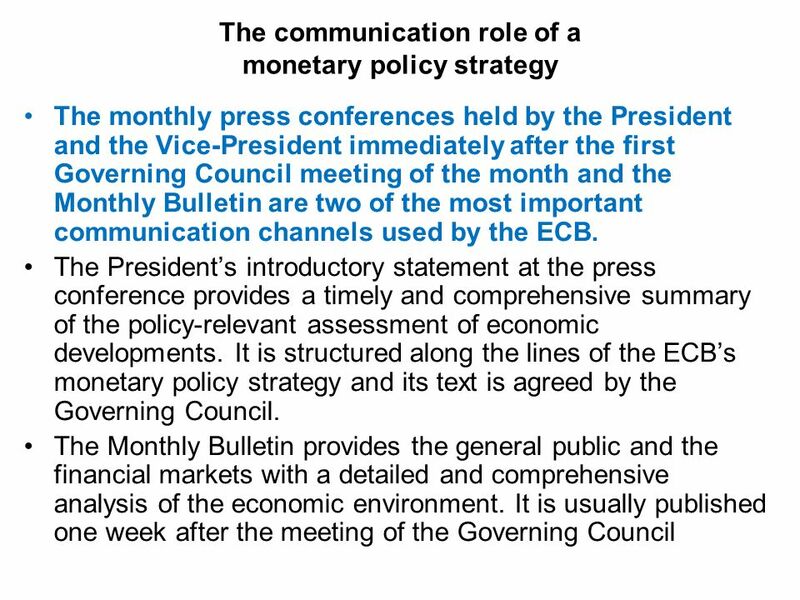 Any communication must reflect the fact that monetary policy has to operate in a complex, uncertain and constantly evolving environment. 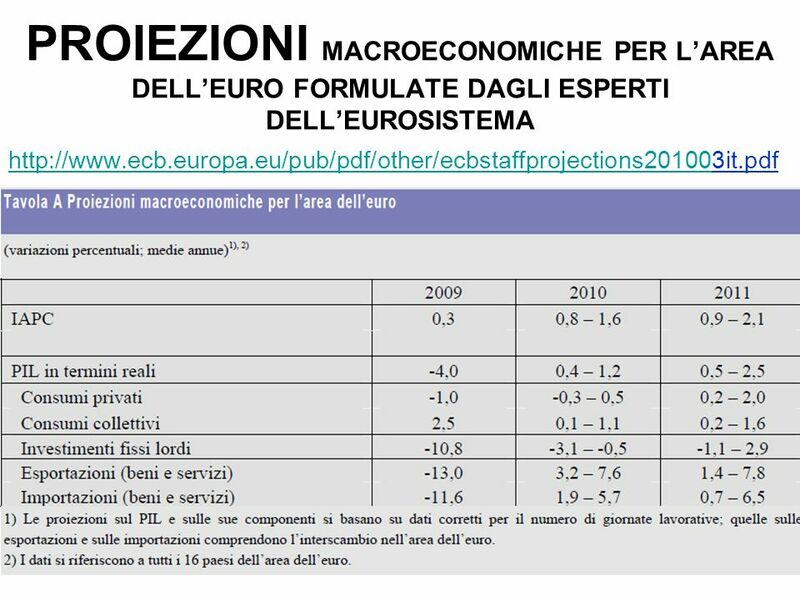 70 Legato a questa tipologia di operazioni è il tasso più importante della zona Euro: il REPO, ossia il tasso minimo di offerta appunto sulle operazioni di rifinanziamento principali. E un tasso a scadenza molto breve (1 settimana) e si riferisce ad operazioni settimanali. Esso è deciso nella prima riunione di ogni mese del Consiglio Direttivo e reso noto alle 1.45 (CET) con un comunicato stampa emesso in tutte le lingue dei paesi aderenti alla moneta unica europea. 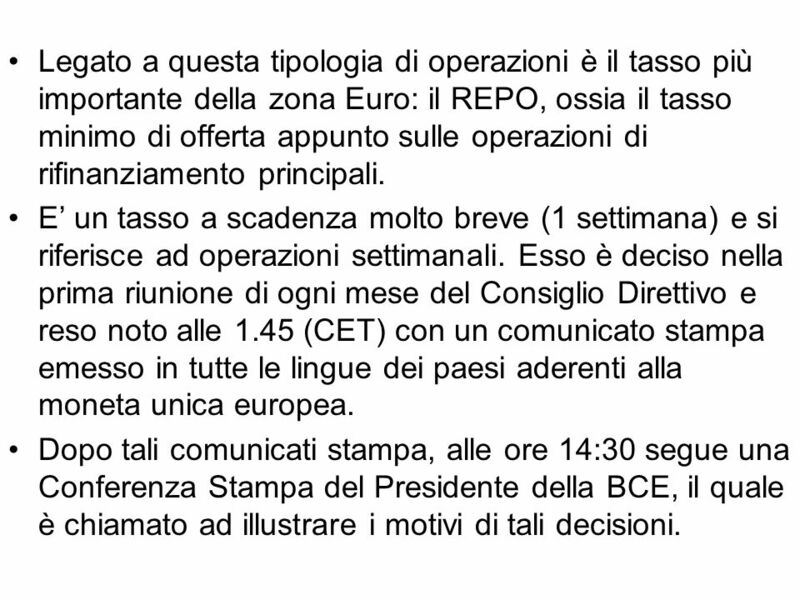 Dopo tali comunicati stampa, alle ore 14:30 segue una Conferenza Stampa del Presidente della BCE, il quale è chiamato ad illustrare i motivi di tali decisioni. 71 Gli altri tassi tendono ad adeguarsi al REPO via arbitraggi. 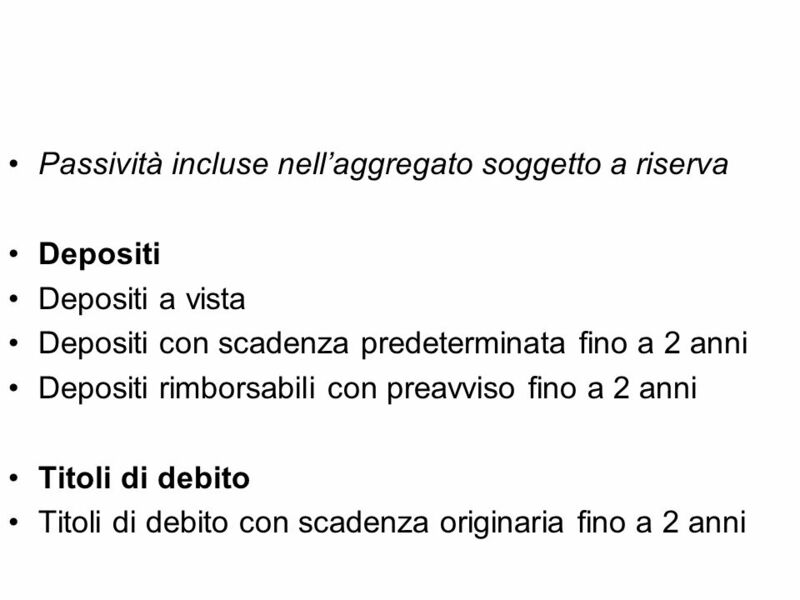 In particolare, come intuibile, larbiraggio è particolarmente forte per il rendimento settimanale dellEURIBOR (tasso interbancario fra le banche dellUME) cosicché per una banca risulta quasi indifferente indebitarsi ad una settimana con la BCE o con altre banche. 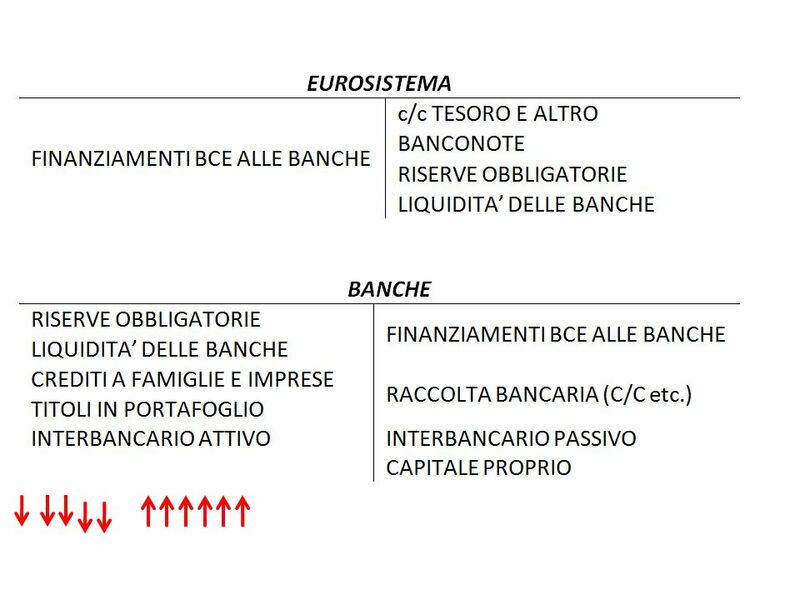 72 Le operazioni di rifinanziamento a più lungo termine sono operazioni di finanziamento del fabbisogno di liquidità che vengono effettuate dalle Banche Centrali Nazionali attraverso aste standard. Hanno frequenza mensile e hanno normalmente scadenza a tre mesi. 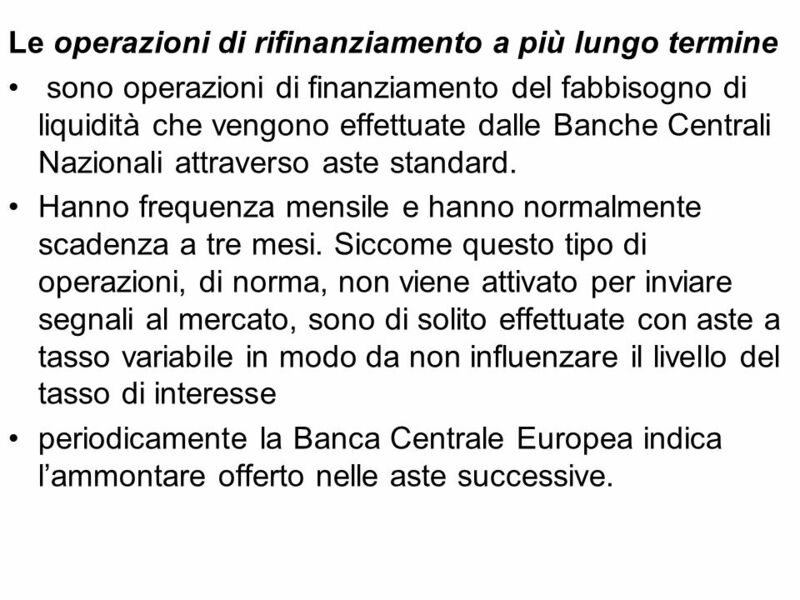 Siccome questo tipo di operazioni, di norma, non viene attivato per inviare segnali al mercato, sono di solito effettuate con aste a tasso variabile in modo da non influenzare il livello del tasso di interesse periodicamente la Banca Centrale Europea indica lammontare offerto nelle aste successive. 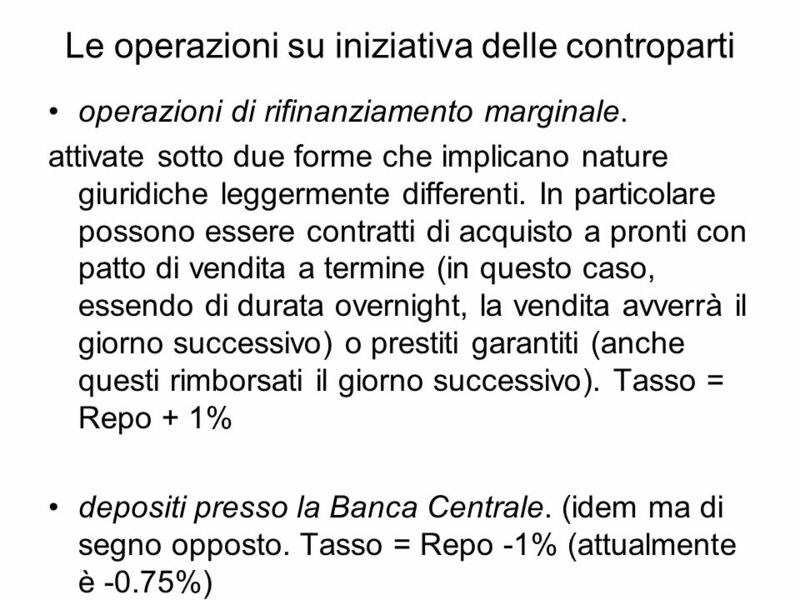 73 Le operazioni di fine-tuning hanno principalmente il compito di ridurre gli effetti causati dalla fluttuazione della liquidità sul mercato e, come già detto possono anche essere attivate tramite swap in valuta operazioni definitive e raccolta di depositi (anche se normalmente rivestono la forma delle operazioni temporanee). 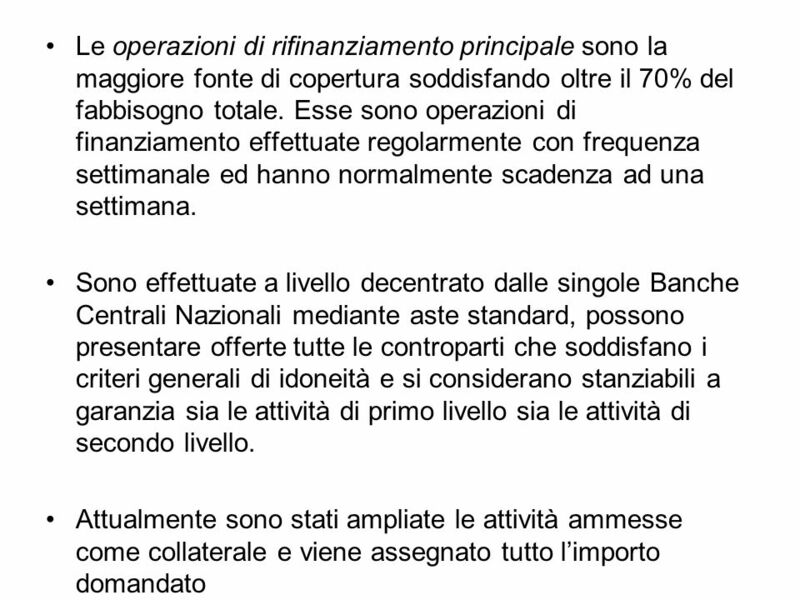 può assumere la forma sia di finanziamento che di assorbimento di liquidità, non ha frequenza regolare e nemmeno scadenza standardizzata. 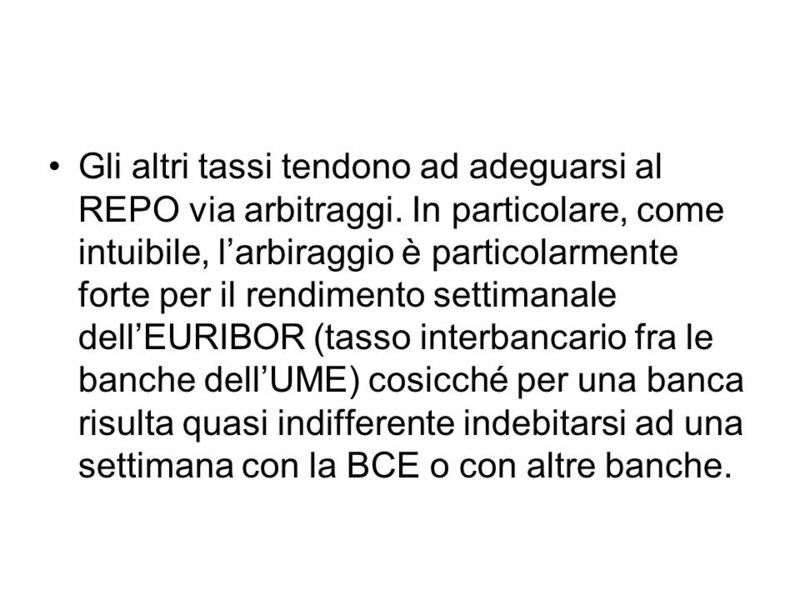 sono attivate dalle Banche Centrali Nazionali (anche se in casi eccezionali il Consiglio può deliberare che vengano attuate direttamente dalla BCE) e lEurosistema può decidere che solo un limitato numero di controparti vi partecipi garantendo il prestito con attività di primo o secondo livello. 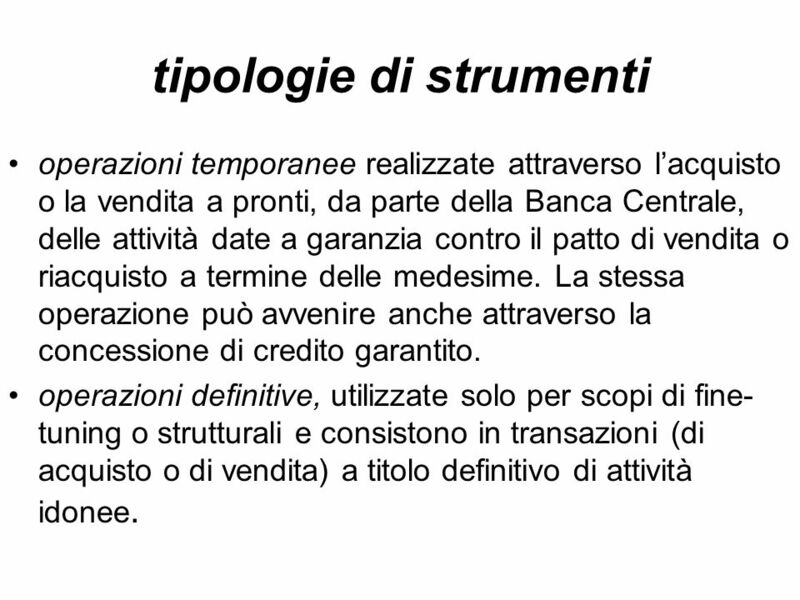 74 tipologie di strumenti operazioni temporanee realizzate attraverso lacquisto o la vendita a pronti, da parte della Banca Centrale, delle attività date a garanzia contro il patto di vendita o riacquisto a termine delle medesime. 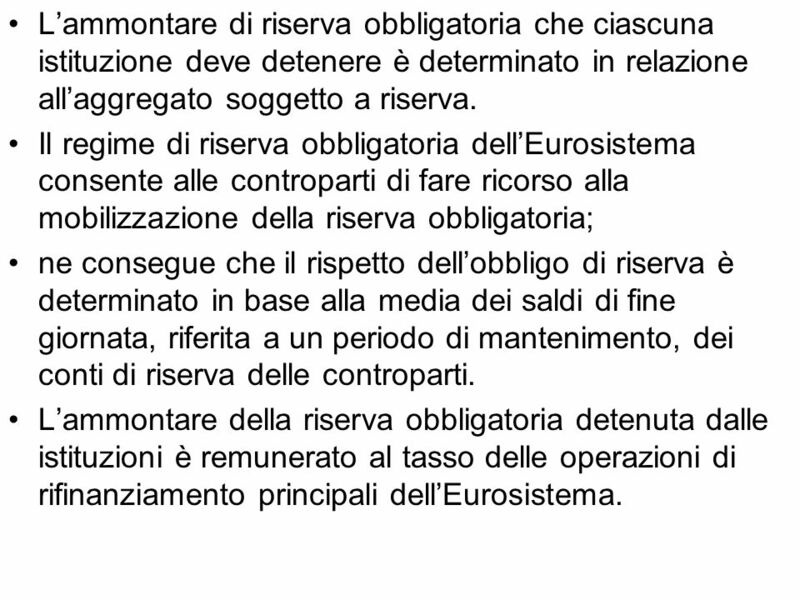 La stessa operazione può avvenire anche attraverso la concessione di credito garantito. 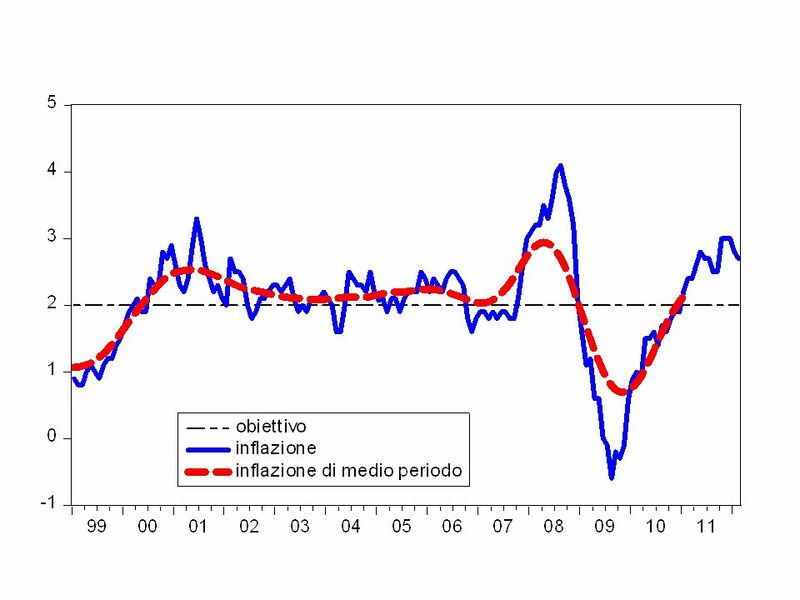 operazioni definitive, utilizzate solo per scopi di fine- tuning o strutturali e consistono in transazioni (di acquisto o di vendita) a titolo definitivo di attività idonee. 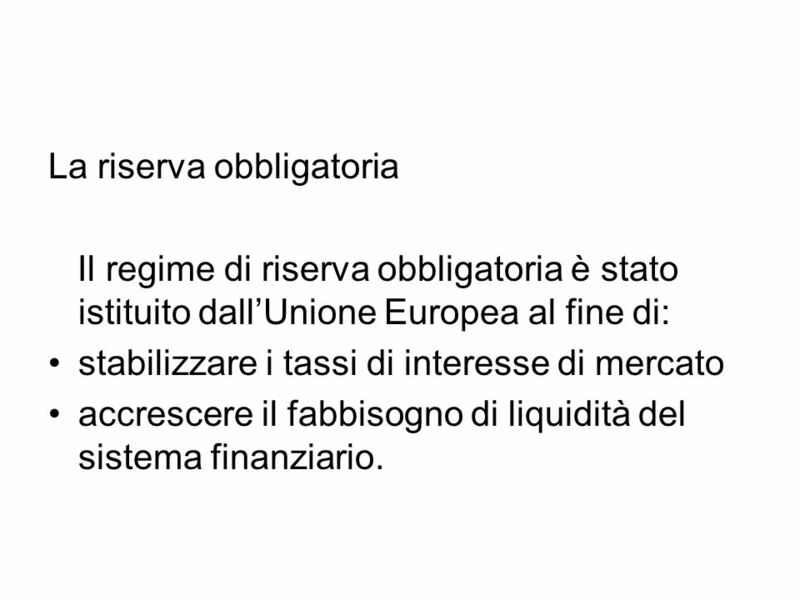 76 La riserva obbligatoria Il regime di riserva obbligatoria è stato istituito dallUnione Europea al fine di: stabilizzare i tassi di interesse di mercato accrescere il fabbisogno di liquidità del sistema finanziario. 77 Lammontare di riserva obbligatoria che ciascuna istituzione deve detenere è determinato in relazione allaggregato soggetto a riserva. 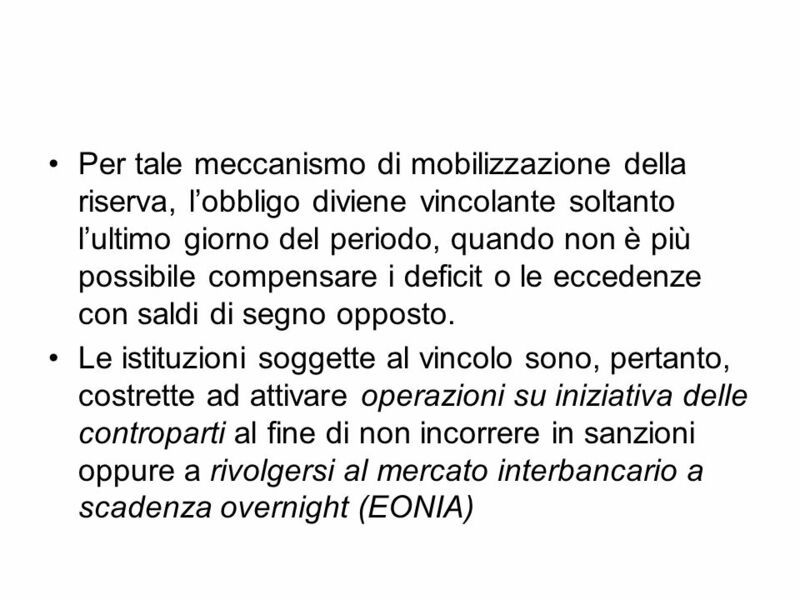 Il regime di riserva obbligatoria dellEurosistema consente alle controparti di fare ricorso alla mobilizzazione della riserva obbligatoria; ne consegue che il rispetto dellobbligo di riserva è determinato in base alla media dei saldi di fine giornata, riferita a un periodo di mantenimento, dei conti di riserva delle controparti. Lammontare della riserva obbligatoria detenuta dalle istituzioni è remunerato al tasso delle operazioni di rifinanziamento principali dellEurosistema. 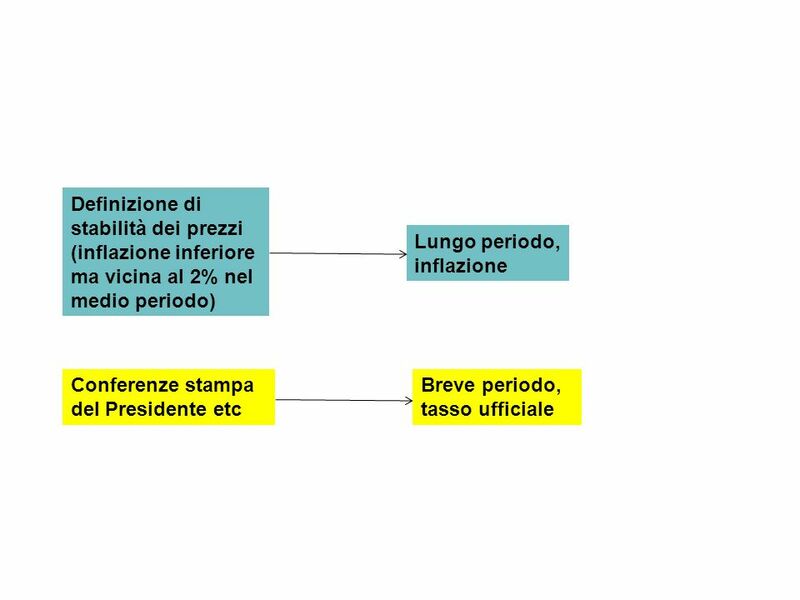 79 La BCE pubblica il calendario indicativo dei periodi di mantenimento delle riserve almeno tre mesi prima dellinizio dellanno. 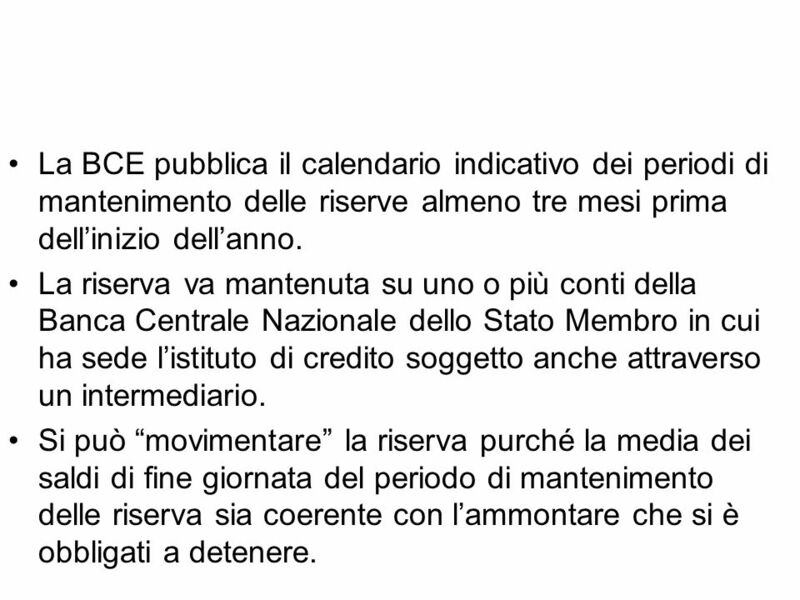 La riserva va mantenuta su uno o più conti della Banca Centrale Nazionale dello Stato Membro in cui ha sede listituto di credito soggetto anche attraverso un intermediario. Si può movimentare la riserva purché la media dei saldi di fine giornata del periodo di mantenimento delle riserva sia coerente con lammontare che si è obbligati a detenere. 84 Stable prices in the long run are a precondition for maximum sustainable output growth and employment as well as moderate long-term interest rates. 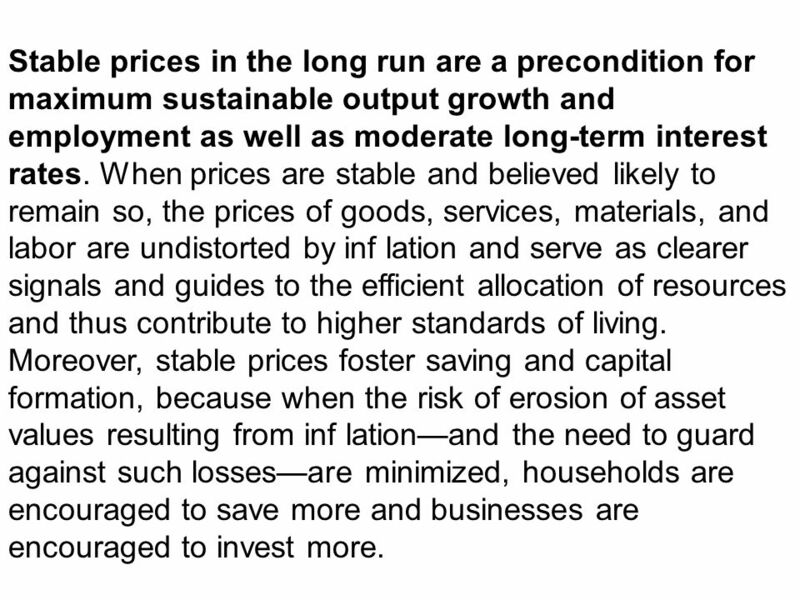 When prices are stable and believed likely to remain so, the prices of goods, services, materials, and labor are undistorted by inf lation and serve as clearer signals and guides to the efficient allocation of resources and thus contribute to higher standards of living. Moreover, stable prices foster saving and capital formation, because when the risk of erosion of asset values resulting from inf lationand the need to guard against such lossesare minimized, households are encouraged to save more and businesses are encouraged to invest more. 85 Although price stability can help achieve maximum sustainable output growth and employment over the longer run, in the short run some tension can exist between the two goals. Often, a slowing of employment is accompanied by lessened pressures on prices, and moving to counter the weakening of the labor market by easing policy does not have adverse inf lationary effects. Sometimes, however, upward pressures on prices are developing as output and employment are softeningespecially when an adverse supply shock, such as a spike in energy prices, has occurred. 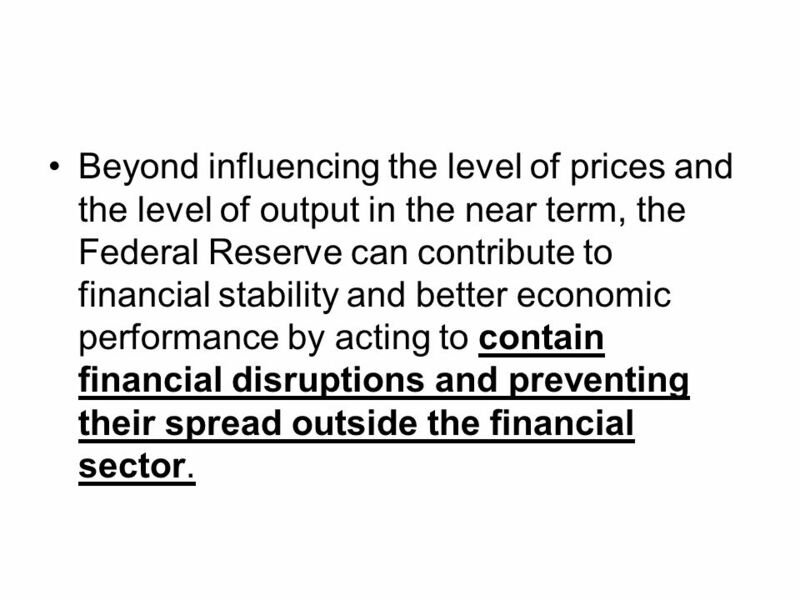 86 Beyond influencing the level of prices and the level of output in the near term, the Federal Reserve can contribute to financial stability and better economic performance by acting to contain financial disruptions and preventing their spread outside the financial sector. 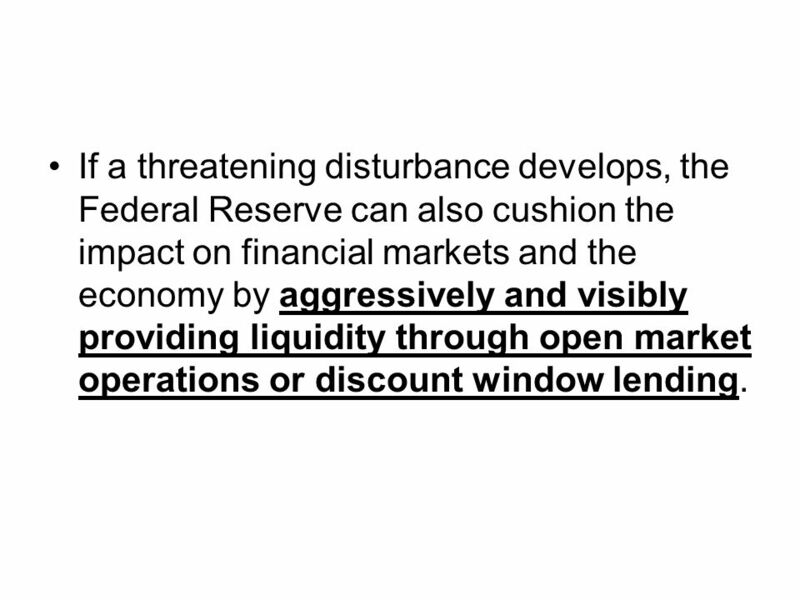 87 If a threatening disturbance develops, the Federal Reserve can also cushion the impact on financial markets and the economy by aggressively and visibly providing liquidity through open market operations or discount window lending. 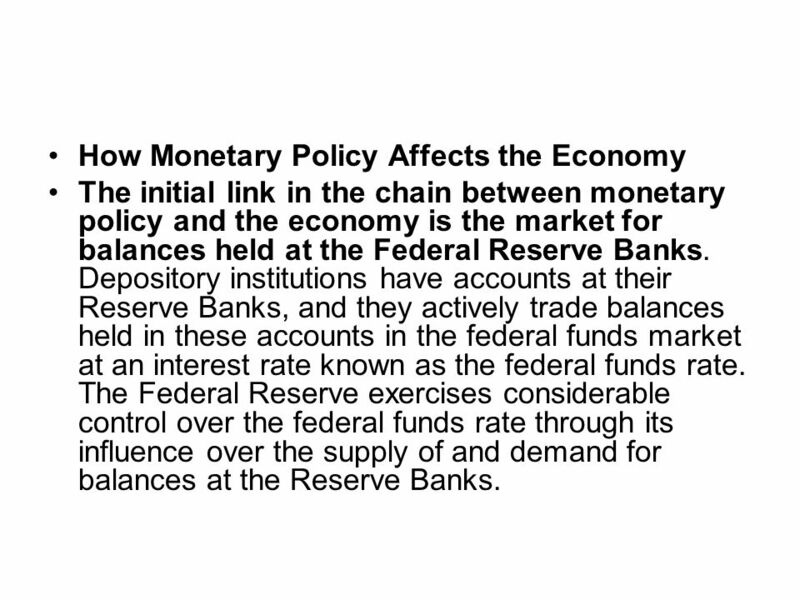 88 How Monetary Policy Affects the Economy The initial link in the chain between monetary policy and the economy is the market for balances held at the Federal Reserve Banks. Depository institutions have accounts at their Reserve Banks, and they actively trade balances held in these accounts in the federal funds market at an interest rate known as the federal funds rate. The Federal Reserve exercises considerable control over the federal funds rate through its influence over the supply of and demand for balances at the Reserve Banks. 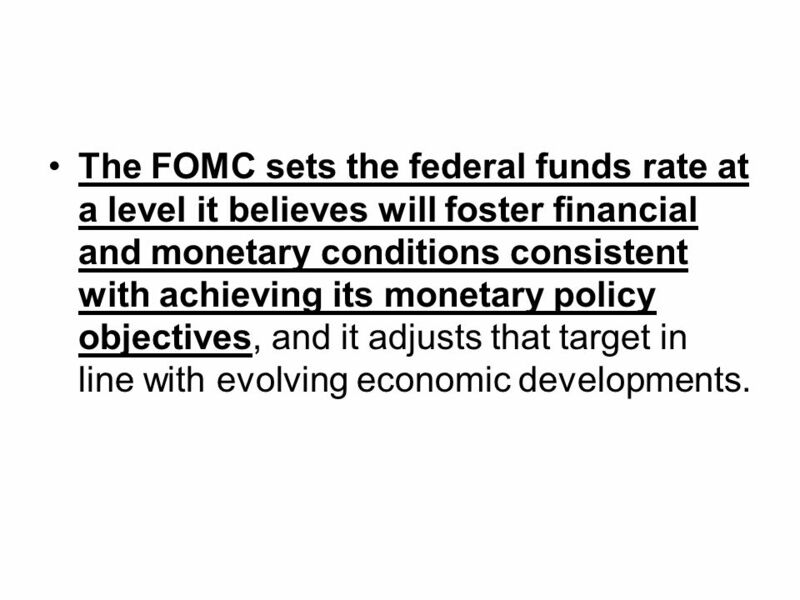 89 The FOMC sets the federal funds rate at a level it believes will foster financial and monetary conditions consistent with achieving its monetary policy objectives, and it adjusts that target in line with evolving economic developments. 90 With substantial resource slack continuing to restrain cost pressures and longer-term inflation expectations stable, inflation is likely to be subdued for some time. 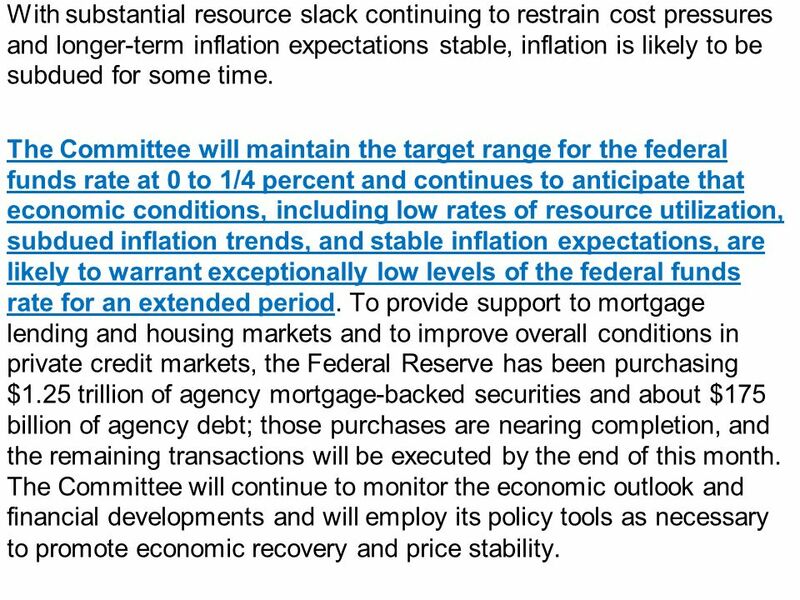 The Committee will maintain the target range for the federal funds rate at 0 to 1/4 percent and continues to anticipate that economic conditions, including low rates of resource utilization, subdued inflation trends, and stable inflation expectations, are likely to warrant exceptionally low levels of the federal funds rate for an extended period. To provide support to mortgage lending and housing markets and to improve overall conditions in private credit markets, the Federal Reserve has been purchasing $1.25 trillion of agency mortgage-backed securities and about $175 billion of agency debt; those purchases are nearing completion, and the remaining transactions will be executed by the end of this month. The Committee will continue to monitor the economic outlook and financial developments and will employ its policy tools as necessary to promote economic recovery and price stability. 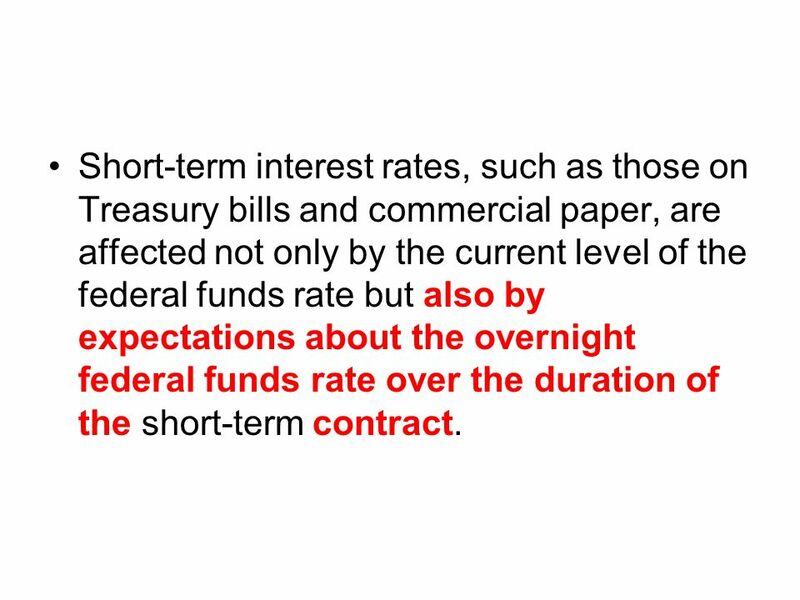 91 Short-term interest rates, such as those on Treasury bills and commercial paper, are affected not only by the current level of the federal funds rate but also by expectations about the overnight federal funds rate over the duration of the short-term contract. 92 As a result, short-term interest rates could decline if the Federal Reserve surprised market participants with a reduction in the federal funds rate, or if unfolding events convinced participants that the Federal Reserve was going to be holding the federal funds rate lower than had been anticipated. 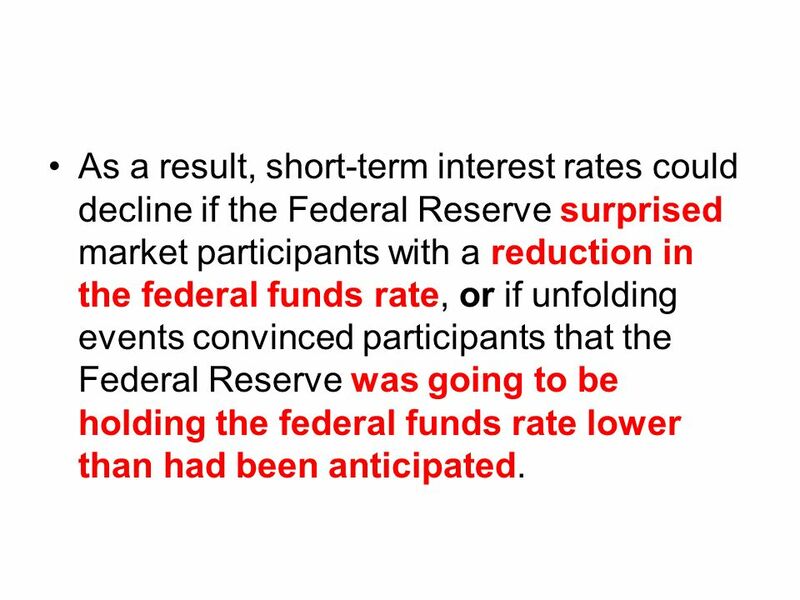 93 Similarly, short-term interest rates would increase if the Federal Reserve surprised market participants by announcing an increase in the federal funds rate, or if some event prompted market participants to believe that the Federal Reserve was going to be holding the federal funds rate at higher levels than had been anticipated. 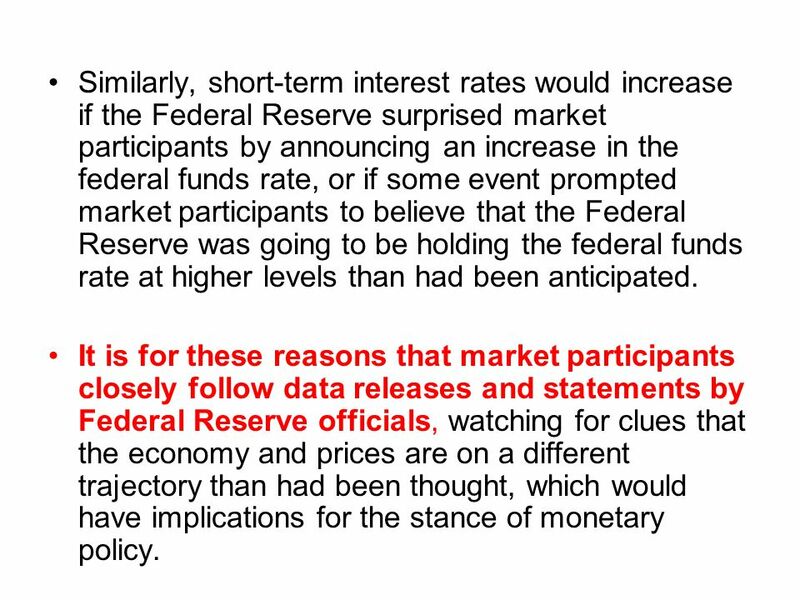 It is for these reasons that market participants closely follow data releases and statements by Federal Reserve officials, watching for clues that the economy and prices are on a different trajectory than had been thought, which would have implications for the stance of monetary policy. 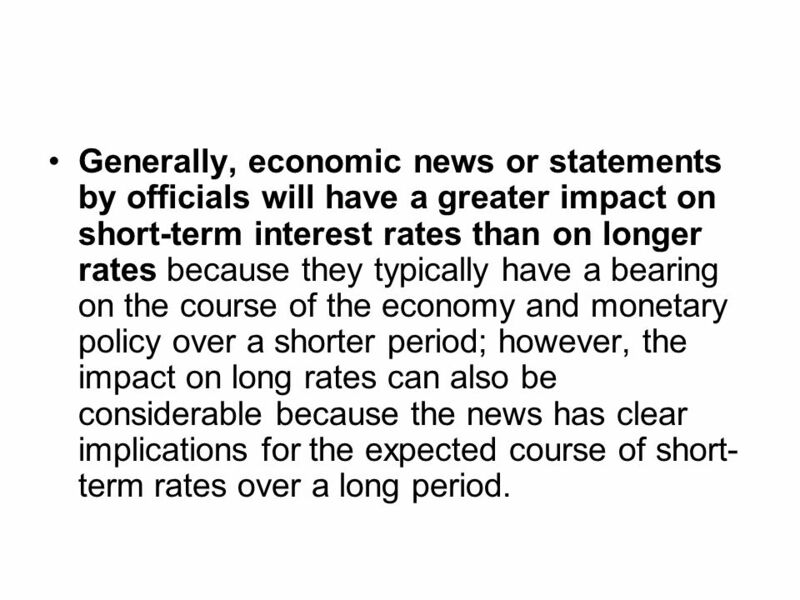 94 Generally, economic news or statements by officials will have a greater impact on short-term interest rates than on longer rates because they typically have a bearing on the course of the economy and monetary policy over a shorter period; however, the impact on long rates can also be considerable because the news has clear implications for the expected course of short- term rates over a long period. 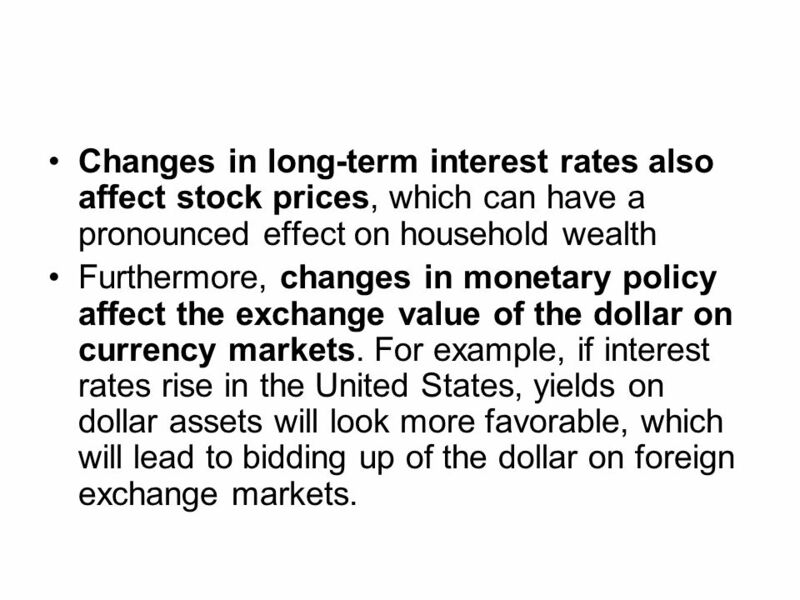 95 Changes in long-term interest rates also affect stock prices, which can have a pronounced effect on household wealth Furthermore, changes in monetary policy affect the exchange value of the dollar on currency markets. For example, if interest rates rise in the United States, yields on dollar assets will look more favorable, which will lead to bidding up of the dollar on foreign exchange markets. 96 If the economy slows and employment softens, policy makers will be inclined to ease monetary policy to stimulate aggregate demand. 97 On the demand side, the government influences the economy through changes in taxes and spending programs, which typically receive a lot of public attention and are therefore anticipated. 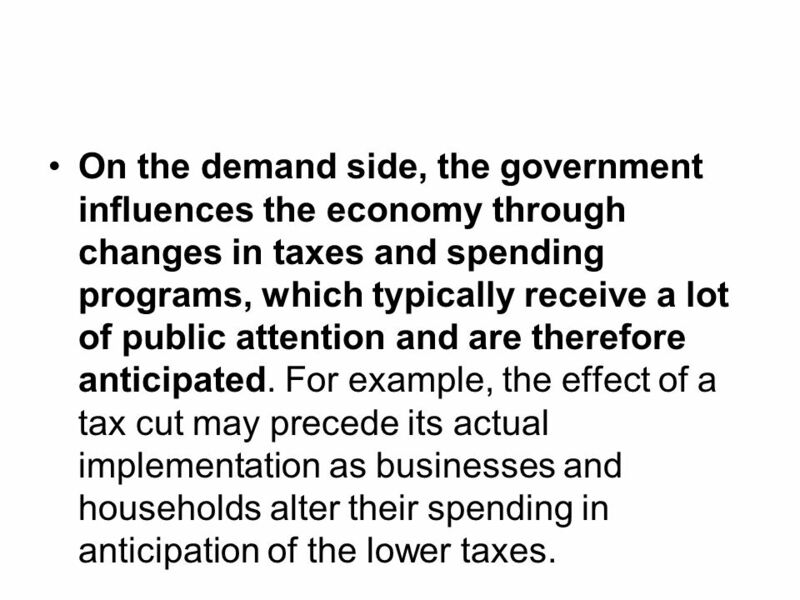 For example, the effect of a tax cut may precede its actual implementation as businesses and households alter their spending in anticipation of the lower taxes. 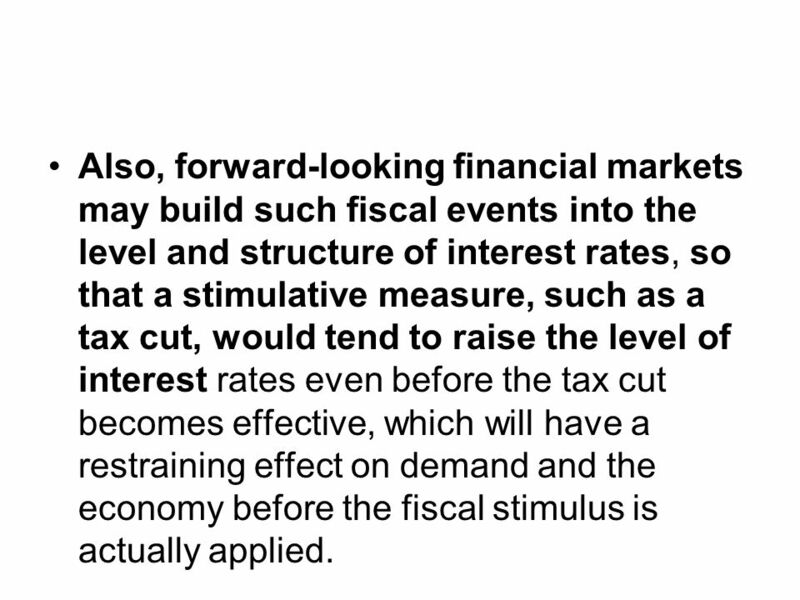 98 Also, forward-looking financial markets may build such fiscal events into the level and structure of interest rates, so that a stimulative measure, such as a tax cut, would tend to raise the level of interest rates even before the tax cut becomes effective, which will have a restraining effect on demand and the economy before the fiscal stimulus is actually applied. 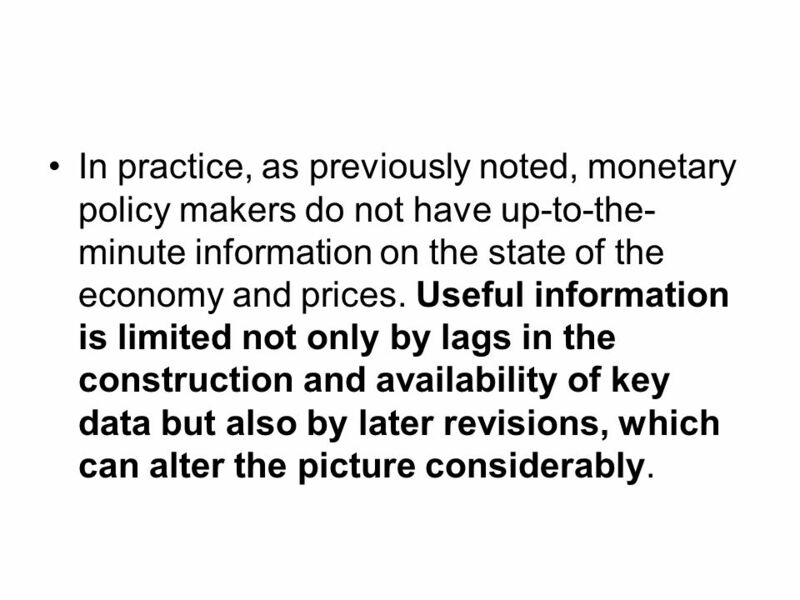 99 In practice, as previously noted, monetary policy makers do not have up-to-the- minute information on the state of the economy and prices. Useful information is limited not only by lags in the construction and availability of key data but also by later revisions, which can alter the picture considerably. 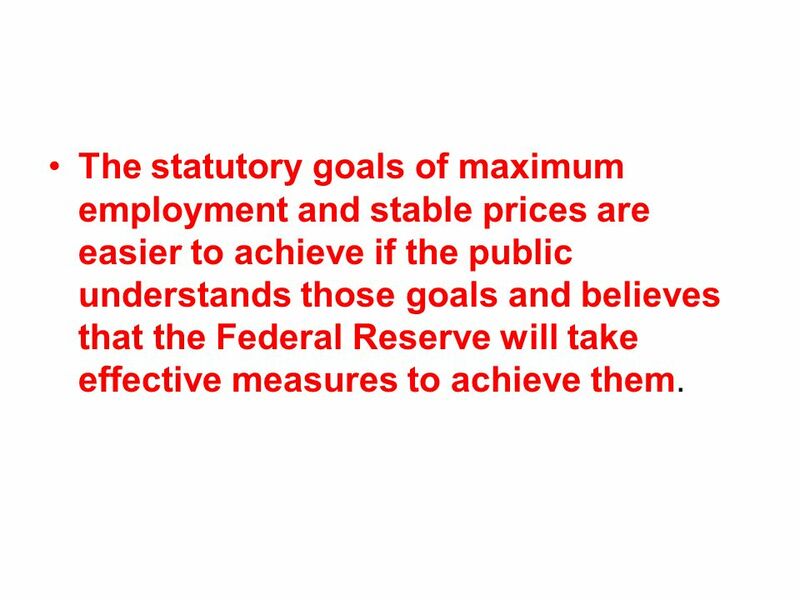 100 The statutory goals of maximum employment and stable prices are easier to achieve if the public understands those goals and believes that the Federal Reserve will take effective measures to achieve them. 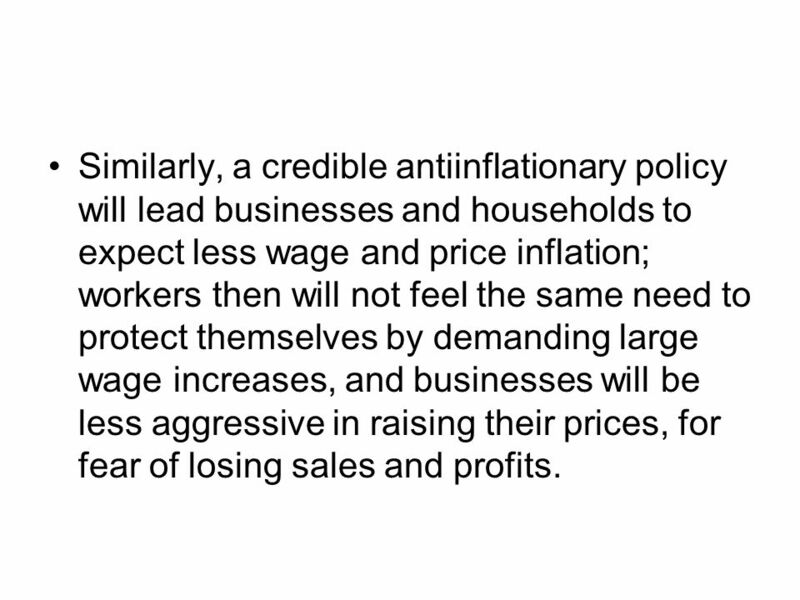 102 Similarly, a credible antiinflationary policy will lead businesses and households to expect less wage and price inflation; workers then will not feel the same need to protect themselves by demanding large wage increases, and businesses will be less aggressive in raising their prices, for fear of losing sales and profits. 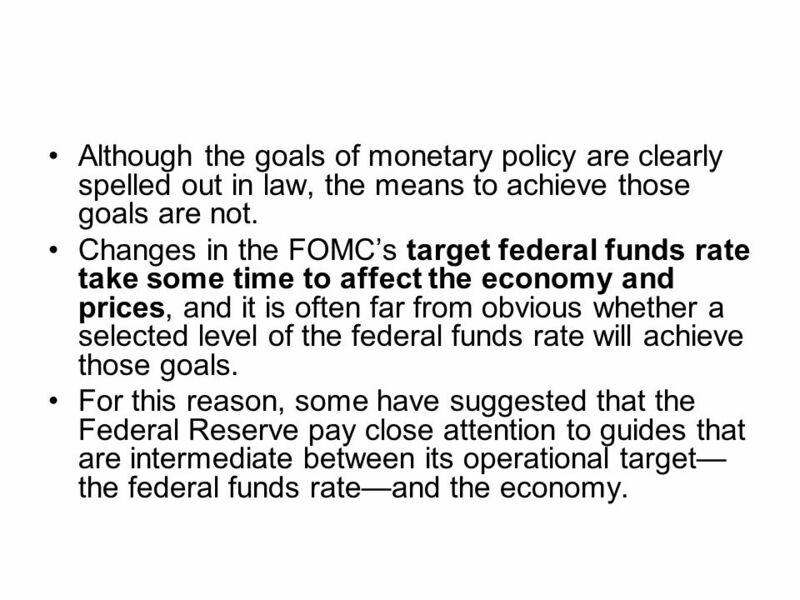 103 Although the goals of monetary policy are clearly spelled out in law, the means to achieve those goals are not. Changes in the FOMCs target federal funds rate take some time to affect the economy and prices, and it is often far from obvious whether a selected level of the federal funds rate will achieve those goals. For this reason, some have suggested that the Federal Reserve pay close attention to guides that are intermediate between its operational target the federal funds rateand the economy. 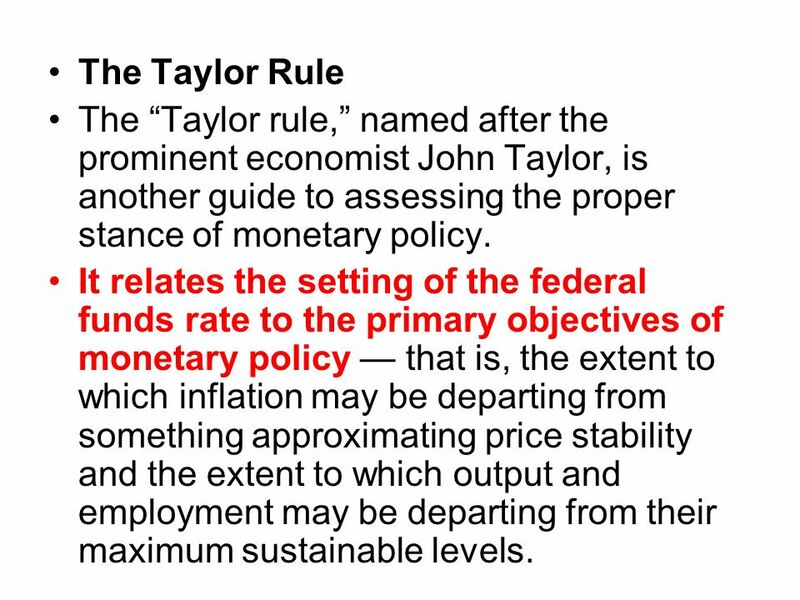 105 The Taylor Rule The Taylor rule, named after the prominent economist John Taylor, is another guide to assessing the proper stance of monetary policy. 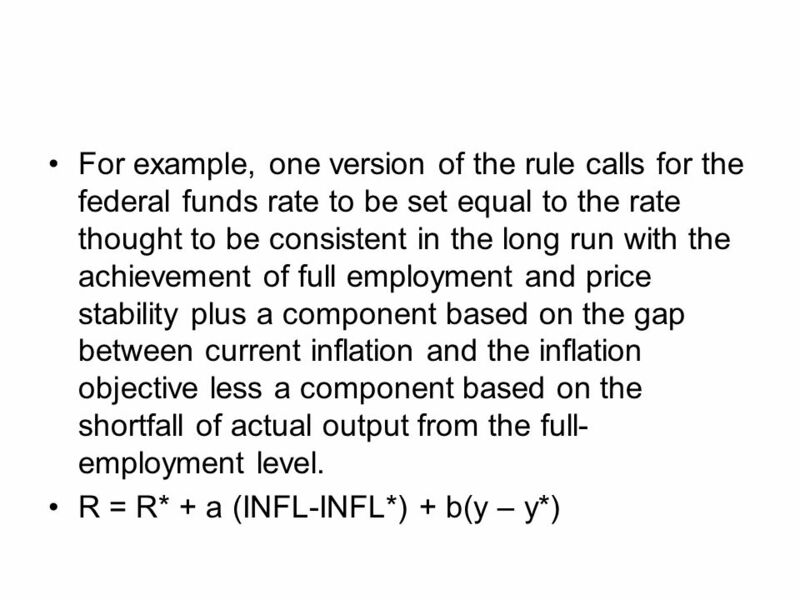 It relates the setting of the federal funds rate to the primary objectives of monetary policy that is, the extent to which inflation may be departing from something approximating price stability and the extent to which output and employment may be departing from their maximum sustainable levels. 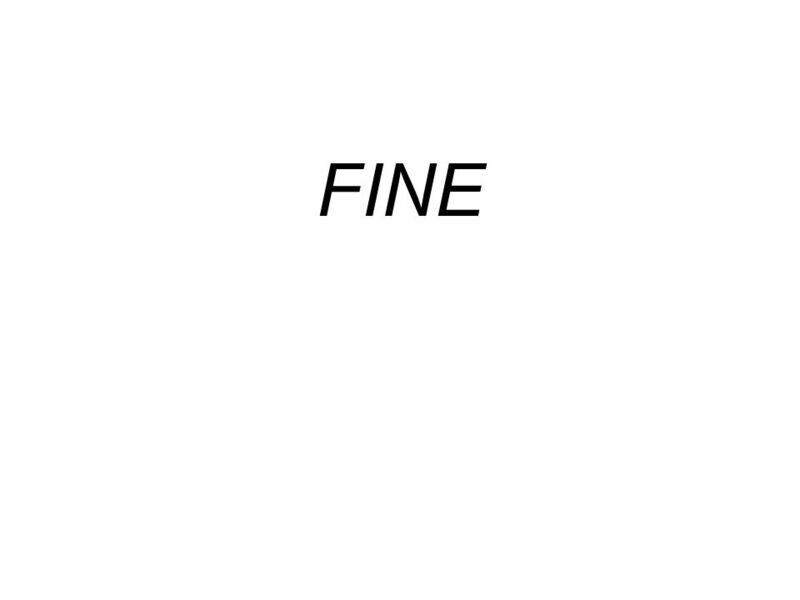 Download ppt "La BCE. 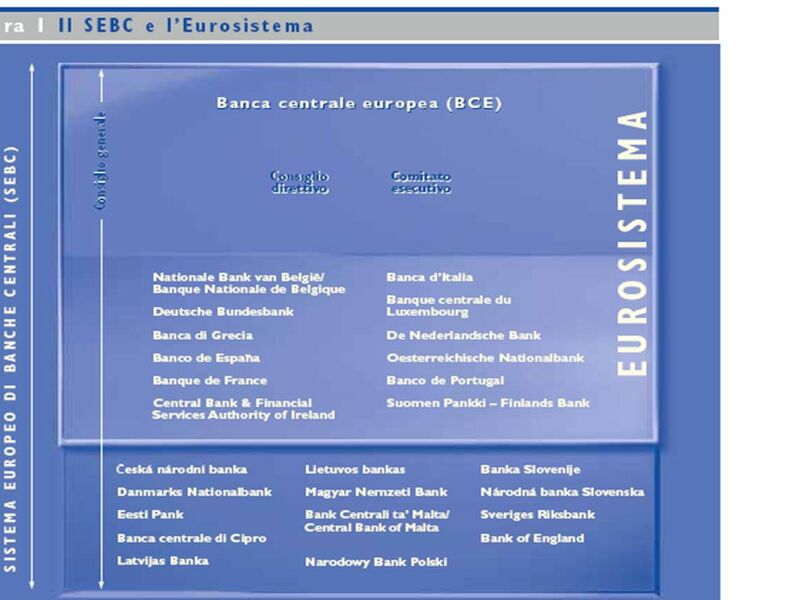 ECB and national central banks -European Central Bank -National banks of member states that have adopted the euro as their currency (countries." AD and AS Tragakes 2012, chapter 9. Aggregate Demand Aggregate Demand (AD): The total quantity of aggregate output, or real GDP, that all buyers in an. The Operational Role of the Bank of England Guo Chenzi Nov.8. Money, Output, and Prices. M1 Money SupplyCPI (1987=100) Over the long term, money is highly positively correlated with prices, but uncorrelated with. 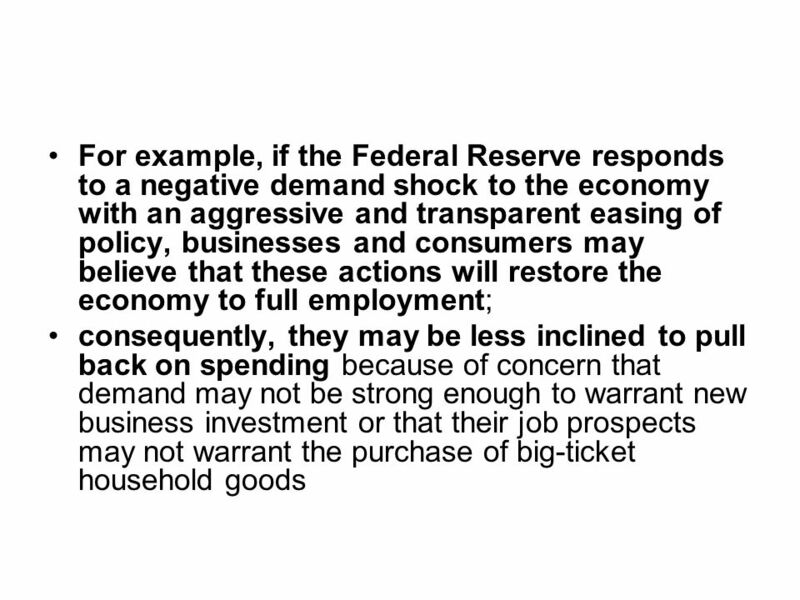 Test Your Knowledge Monetary Policy Click on the letter choices to test your understanding ABC. Economist and the Federal Reserve. What they do Economists at the Board conduct independent economic research and contribute substantially to the economic. 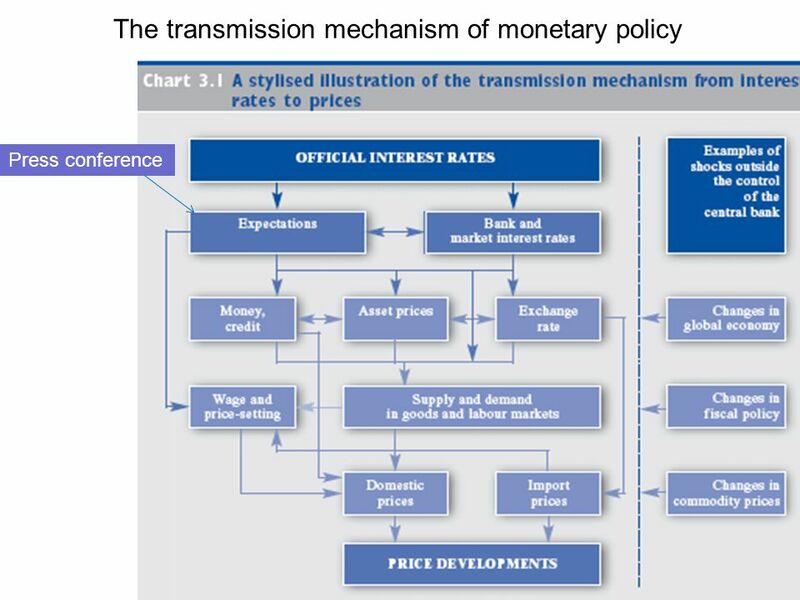 The Global Economy (The Art of) Monetary Policy © NYU Stern School of Business. 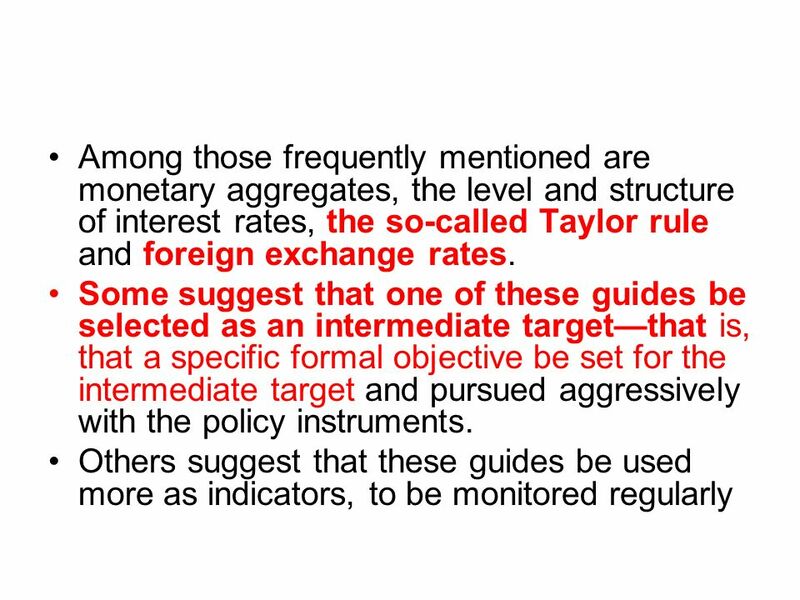 The transmission mechanism of monetary policy Banco Central do Brasil conference: “One year of inflation targeting” 10th July 2000 Alec Chrystal Bank of. Monetary Policy. What is Monetary Policy? 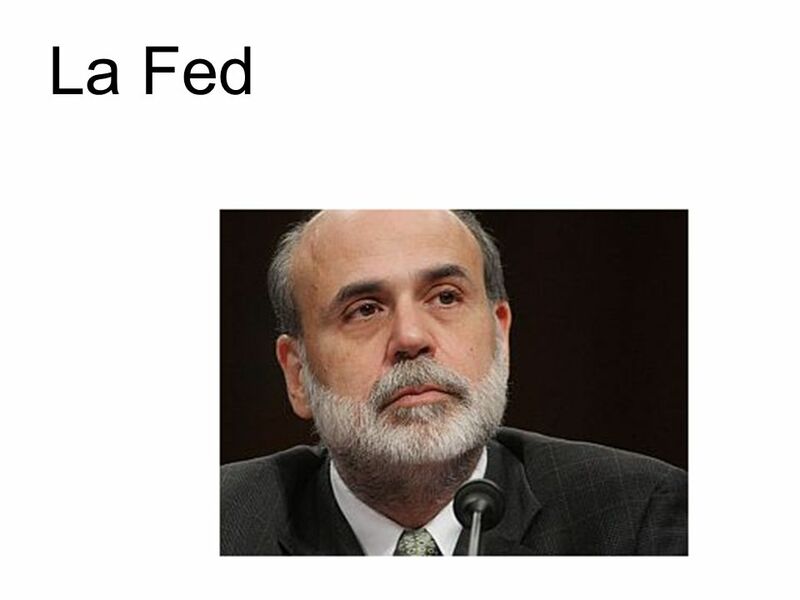 Monetary policy is the manipulation of the money supply, interest rates or exchange rates to influence the economy. 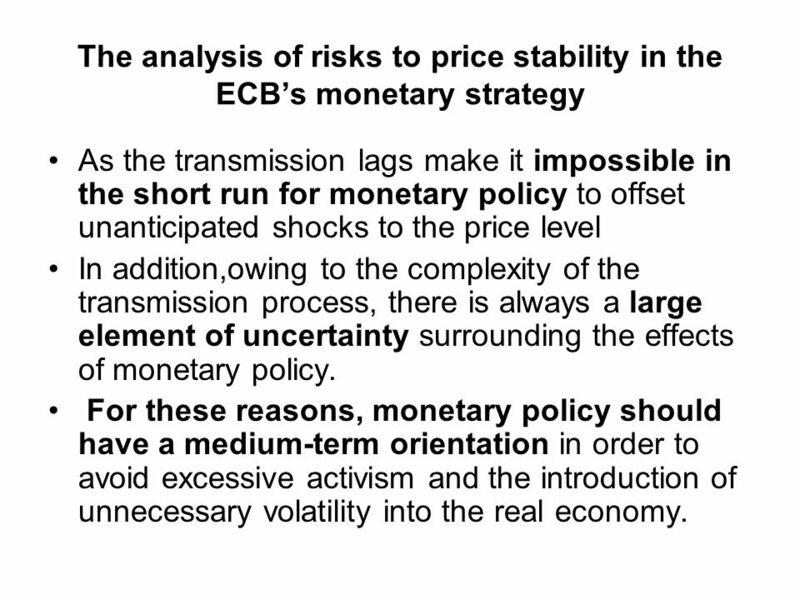 The Eurosystems’ monetary policy strategy Maarten Hendrikx Economics & Research Division Monetary Policy Department Operational Monetary Policy Seminar. Money in the Economy Mmmmmmm, money!. 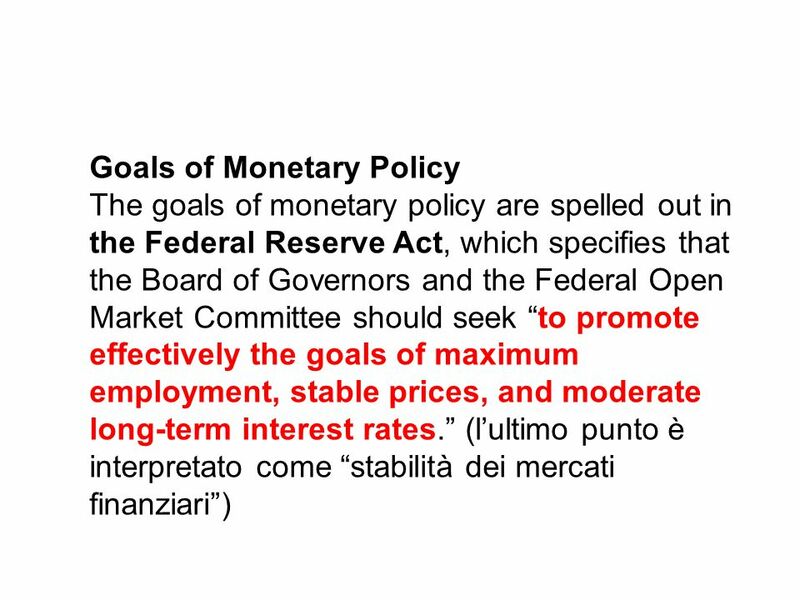 Monetary Policy A tool of macroeconomic policy under the control of the Federal Reserve that seeks to attain stable. 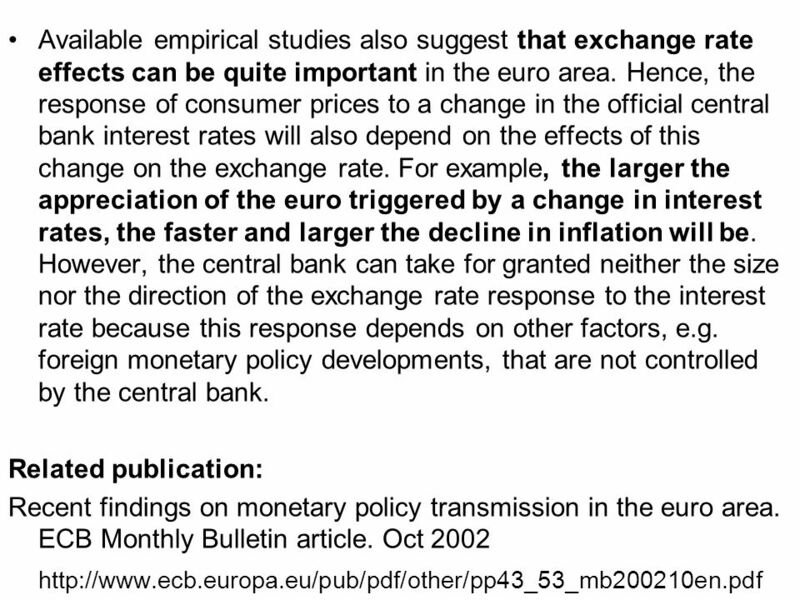 ECB: European Central Bank John-Paul Kivlin Educational use only.